What is happening in the club. 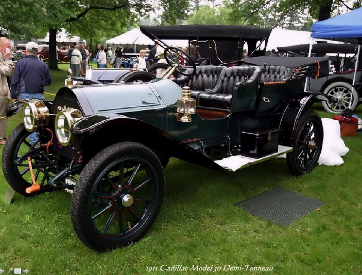 Coffee call notes, Saturday April 13, 2019, LA MADELEINE - I confess.....I went to coffee call but it was raining so hard I didn't even make the turn into CREST market to see if anyone braved the last gasp of winter and put their car on display. 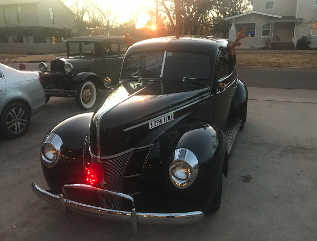 Koy Floyd gets the cRc badge of honor this weekend for braving the elements and driving his classic 1937 Chevy to coffee call in spite of the weather. What I did was have a great time at our newest rotation restaurant, LA MADELEINE! La Madeleine is a Dallas, Texas chain of 86 French themed restaurants serving up a very nice looking breakfast and lunch. They have a great coffee bar and OMG we actually had ceramic cups....most of us kept looking for the styro cups but this was the real deal! All in all, it was just a new location coffee call in a fun new spot on a rainy day. Visiting with good friends, lots of conversations, a few of the same stories, and a few lies - but mostly just fun. Next weekend is the spring cRuise, hope you signed up. 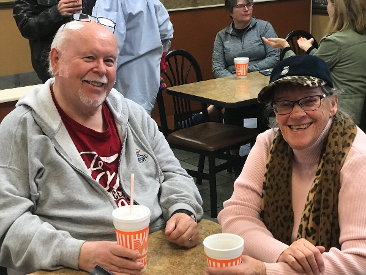 We will meet at WHATABURGER for coffee call and we will leave when CAROL AND JIM SAY "TIME TO GO" 9am....a fun time is expected as we venture out of state for the first time. Look out TEXAS cause "here come the cRuisers!!!" The thank LA MADELEINE FOR HOSTING US. WARNING: We will be back. In other club news, we held our 2nd quarter 50/50 pot at RUDY'S, and Dan Haggerty walked away with some nice spending money. In a different twist to the traditional 50/50, winner Dan selected at random a little card which magically changed his winnings to a 60/40 pot. Cars are available for 50/50, 60/40, 70/30, 80/20, and 90/10 payouts - you just have to pick the best one! While the threat of bad weather postponed the FORDS vs CHEVY annual event, we did pick a rain date. It will be held at the Rose Rock car show on May 4th. The count will be held at high noon. Winners get bragging rights until the next year's event. Get 'em ready! 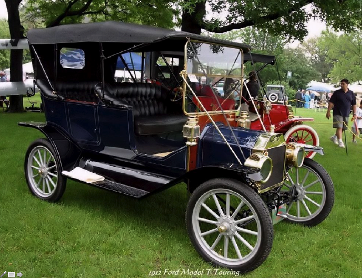 Only Ford Division products and Chevrolet Motor Division vehicles will be counted, not Lincoln or Mercs or Buick, Pontiac and Oldsmobiles. Happily, there is no grudge with those cars. In other club news, Wayne Saunders has managed to purchase a 2 CV (Iconic French minicar)......and it is in running condition. We can't wait to see his little orange "2 horse". Posted 3/30/19 CONGRATULATIONS on a real birthday event. 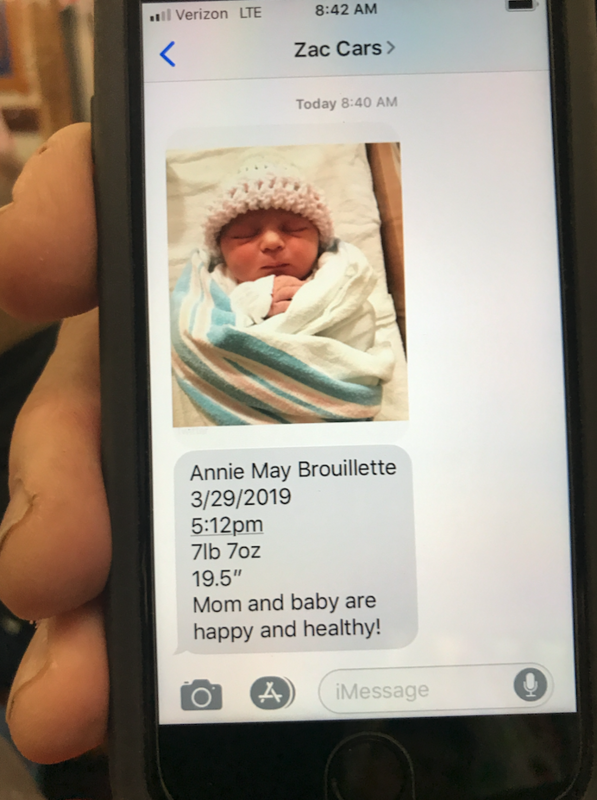 While the club was at Midway celebrating our 11st birthday, the Brouilette family was busy with a birthdate of their own. Born yesterday afternoon, Annie May is the newest and youngest girly gearhead to be in the club. We welcome you Annie May! And at MIDWAY this morning, a bit of high spirited Tom-Foolery was in the air. It was the club's 11th birthday and we all had fun (the evidence is below), with cake and cupcakes and party favors. Everyone got in the spirit of the event. We began to sign up cars for both the new Norman Native American Founder's Day Parade on Lindsey, and the Rose Rock Parade in Noble. See Terry O'Dea to get your car on the list. spaces for the Norman show are limited. 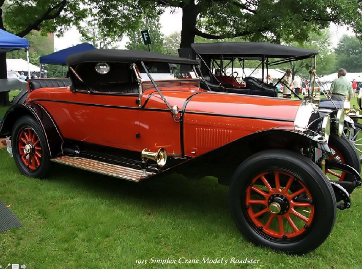 If you are not planning to attend the rose Rock CRC car show, please consider participating in the Norman parade. This next weekend we will have our 3RD annual FORDS vs CHEVYS vs MOPAR "drive 'em and count 'em" event at RUDY'S BBQ. 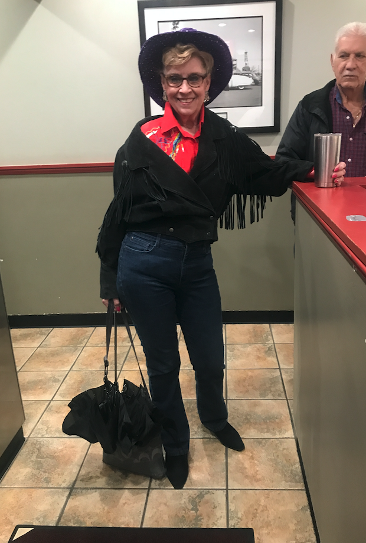 Kay receives at $25 gift certificate to LEGEND'S on Lindsey for winning the best gIrly cowgirl outfit on Cow day. 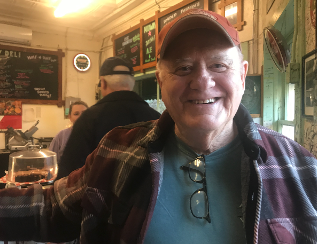 Congratulations to MIDWAY BOB THOMPSON (below) for the great article about Midway Grocery in this week's OUDAILY newspaper. Flash reporter Lani spied it out...... if you find a copy of the OUDaily, pick it up and read a bit more about the fun workings of our cRc WORLD HEADQUARTERS. You can easily understand why we keep coming back month after month, year after year. Thank to the efforts of the canadianRIVERcruisers, the Kerew won the "best lights" trophy. This, in part, a result of the crc members decorating their cars for the parade. Shown below is Betty Maufacci with the trophy. The trophy becomes a part of the many memories on display at Midway Grocery. Thanks to all cRc members who gave their time to support this community event. 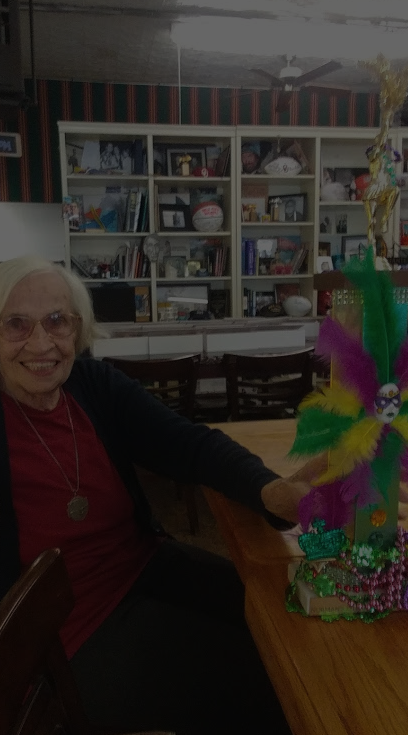 Our trophy with our Duchess 2019, Bette Maffucci. We're keeping it at Midway where you guys can enjoy it with us. Your HQ is our Office! From left to right: Gentleman cowboy Lawrence Terry, Rootin' Tootin' Ray Waldron, in the back, Black Bart Roy Sherry, in the front card shark Jon Forman, behind and to the right greenhorn Dave Saunders, in front sharpshooting' Kay Cook, and in black, the "HIGH SHERIFF" Michael Fain. Thanks to all our cowboys and cowgirls. Not shown, Juan Villareal who was wearing a horsehair belt. MARK THIS UPCOMING WEEKEND ON YOUR CALENDAR - the cRc 11th birthday party! MIDWAY GROCERY, come whenever but the action officially begins at 8am or so, we will have cake and party favors, coffee is on the house. There might even be a Transcript reporter to cover the event, so polish up those beautiful classics. SEE YOU THERE. HAPPY BIRTHDAY CRC!!! 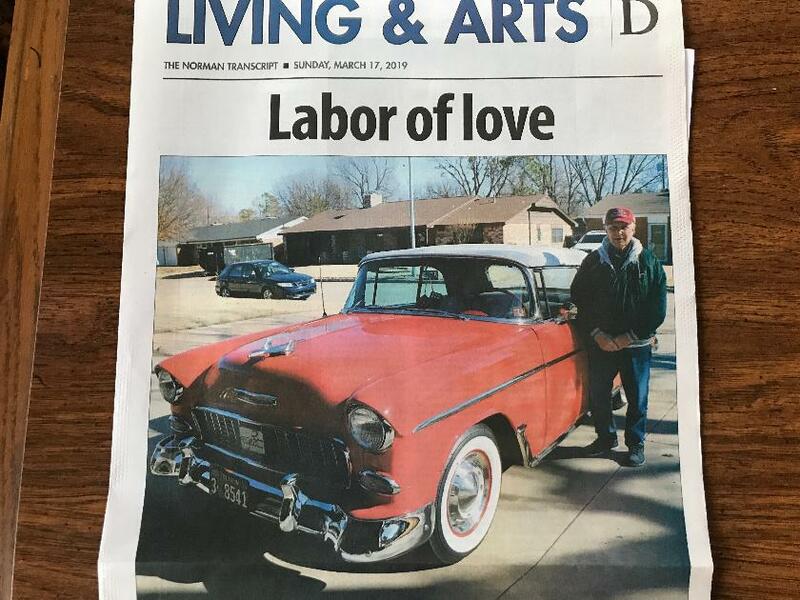 Congratulations Charlie to you and your beautiful 1955 Chevrolet for being this month's Doug Hill "DIG MY RIDE" featured article in Sunday's Living and Arts section of the Norman Transcript. 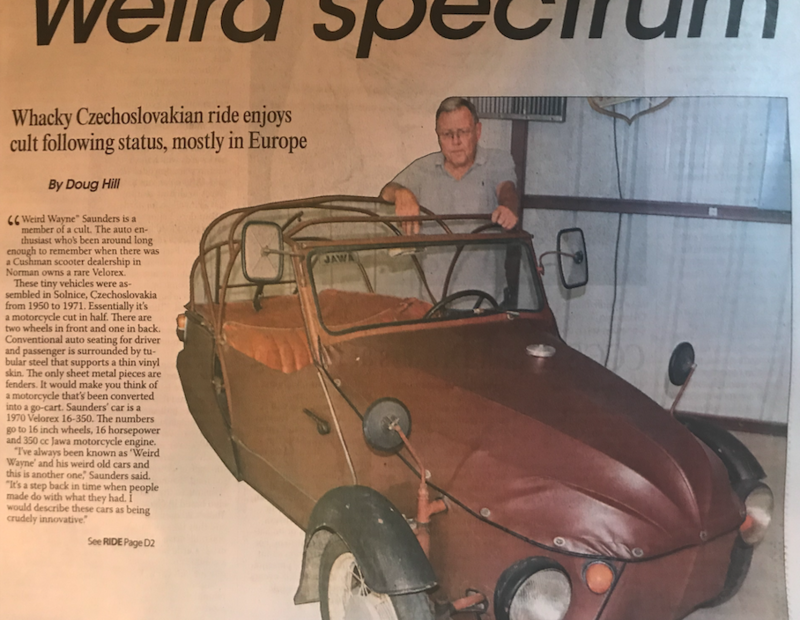 Great car, great man, and great article. Jon Forman has a new bike which he rode to the swap meet. A new Honda 125cc CUB, designed to be ridden in town, a beautiful new addition to his collection of bikes and motorcycles. We interviewed Jon on YouTube and the interview is on the "POTATO, POTATO, POTATO (motorcycle interest page). Click the button below to go there and watch and listen. 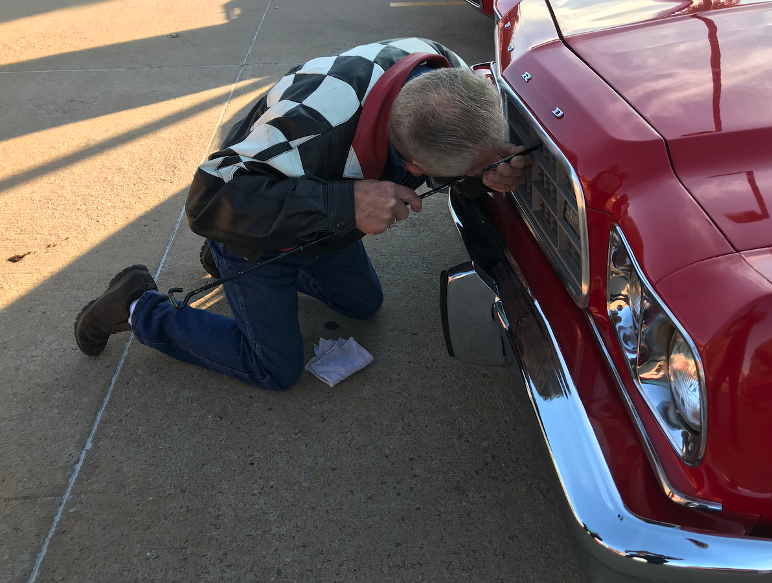 Report from the Norman Spring swap meet: We came, we bought and sold, and we ate more donuts than the law allowed......and we had fun. 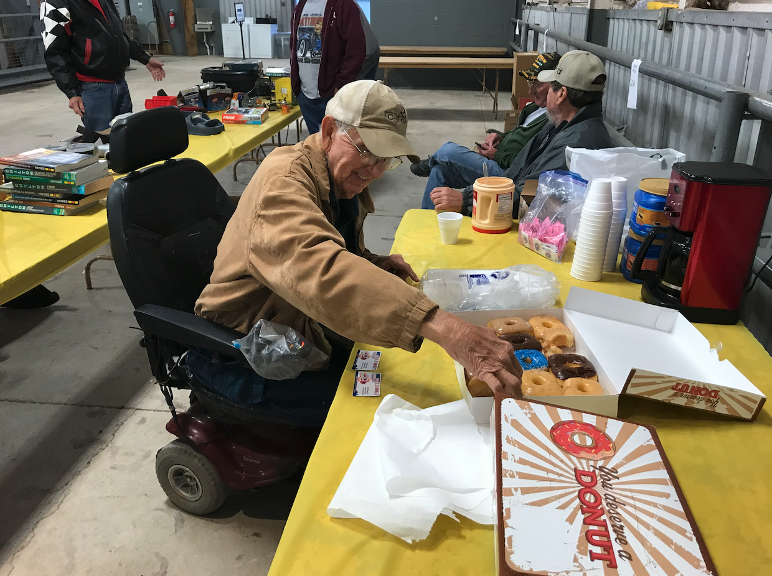 Special thanks to Lawrence Terry and Harlan Butler and Ken Dewbre who were always in and out the booth and hawking things, making coffee, or cleaning the left over parts. 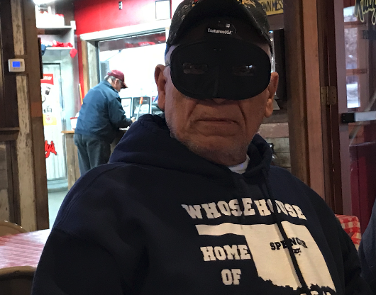 I truly believe that Lawrence just lives for the next swap meet - he is EVERYWHERE in and out of the booth, helping to sell, occasionally purchasing, making fresh really strong coffee, and straightening up the booth. The club sold enough to pay for the fall meet ($155.00), and put a little in the treasury to boot. We decided to change the rules slightly for the Fall meet. Any club member is encouraged and welcome to place items into the meet for sale...HOWEVER, they MUST be labeled with where the money goes (to you or to the club), and also what the part is and what it fits. 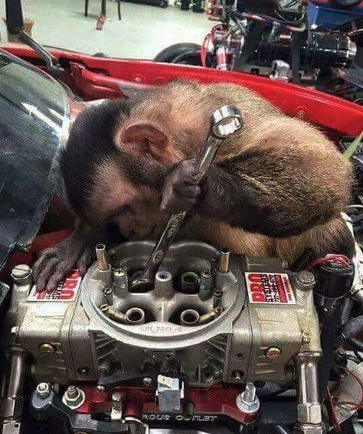 Without that basic information, we have a difficult time telling someone whether or not the part will work on his/her car. Many members just abandon these parts at the end of the meet (which is ok and we understand). In the past, we have been picking them up and storing them until the next meet. We will make a judgement on all parts left over as to whether they will sell and some unclaimed parts will be placed into the dumpster. We have gotten to know some of these parts over the years as they have been hauled back and forth. A few of them found their way to other booths this year, early in the morning, as we tried to make room on our tables for parts that might actually sell. 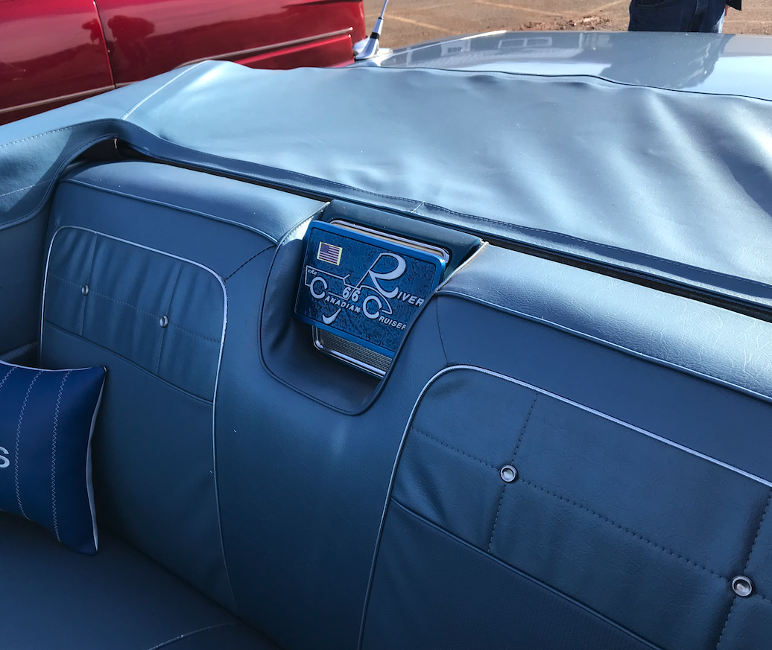 The booth across the way was the recipient of all the 1989 Chilton repair manuals, and the booth down the way unknowingly received a couple of headlight assemblies. Harlan even managed to sneak a part into one guy's wagon as he came by the space. 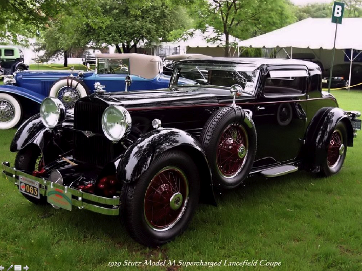 It was reported that Marshall sold 2 of his cars at the show. 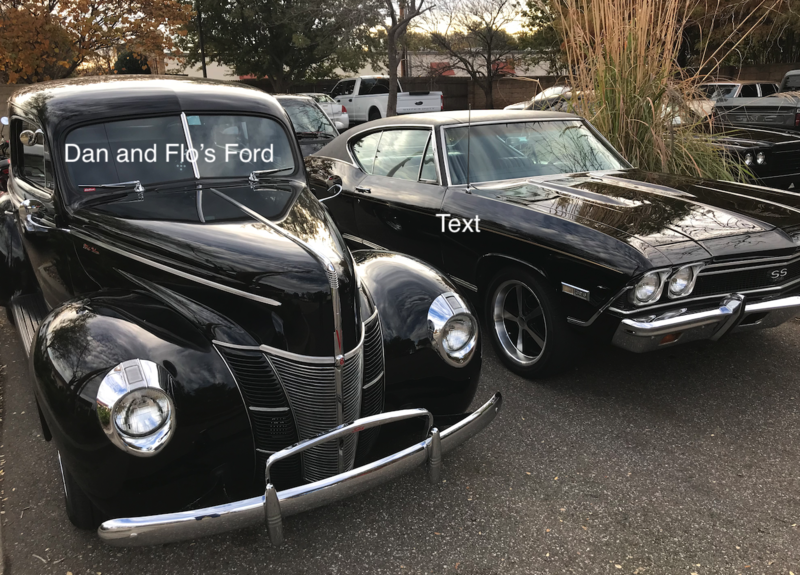 Bill McBee had his Samuri out there and Zack the Younger had his recent Ford pickup there. 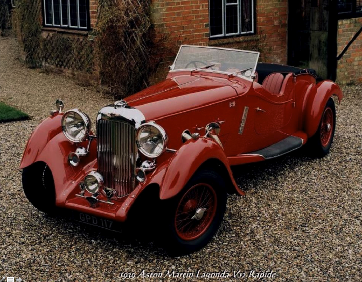 March 12th - a great retrospective of those 1950's complete with music and some great, great classic cars. 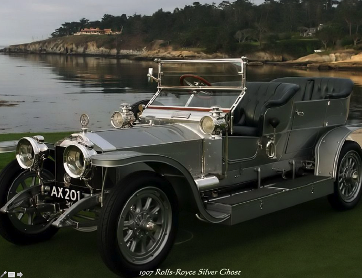 It is posted on the Antique roadshow page, but you can click the button below and go there. Don't forget to turn up your speakers! NEW RESTAURANT ALERT: Announced on Sunday, March 10th in the norman Transcript is a new restaurant coming early summer 2019 to downtown Norman, in the former McNellie's Pub building, 121 East Main St. "THE MEATING PLACE" is a former food truck which served BBQ - going upscale. If anyone eats there early on, please drop us your thoughts so we can publish. 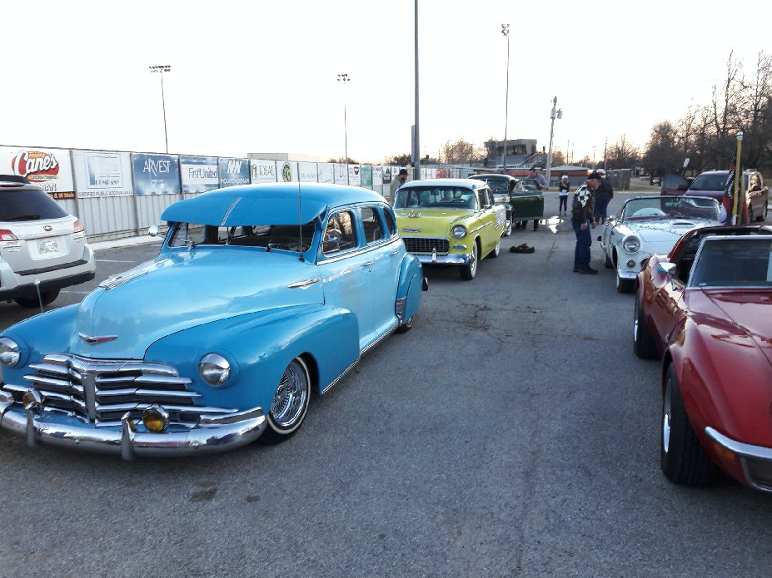 Charlie Lunsford wins the frostbite award this Sunday March 10th for driving his 1955 Chevy "TOP-DOWN" to the Norman High School Garden Car Show. It was cold with a strong wind. Fortunately, Johnnie's Broiler and starbucks were close by.....they had about 25 cars for a nice start to their fund-raiser. They plan to move the show to September in the future, which was fine with us! 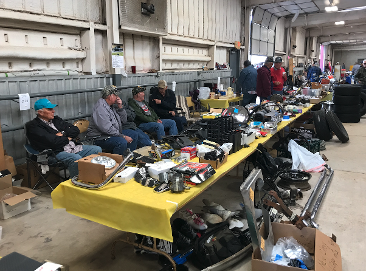 This week's big event will be the spring Swap Meet at the Cleveland County Fairgrounds - you know the drill, show up with your WELL MARKED PARTS and magically most of them get sold. Eat all the donuts you can, and drink all of the coffee you can hold. Visit and tell lots of lies. Wear cRc shirts and hats if possible so we can find you if someone wants to bargain. Have a great time. Go home with cash in your pocket. Donate a little to the club so we can pay for next fall's booth. Posted March 2 - check out the new concept in personal drone transportation by AIRBUS.....on Harlan's cool internet page, where else? Click the button below to go there. Coffee grounds - RUDY'S, March 2, 2019 - "A LITTLE OF THIS AND A LITTLE OF THAT"
On the left is the "distinguished JUAN, on the right the mischievous JUAN. Can YOU tell the difference? 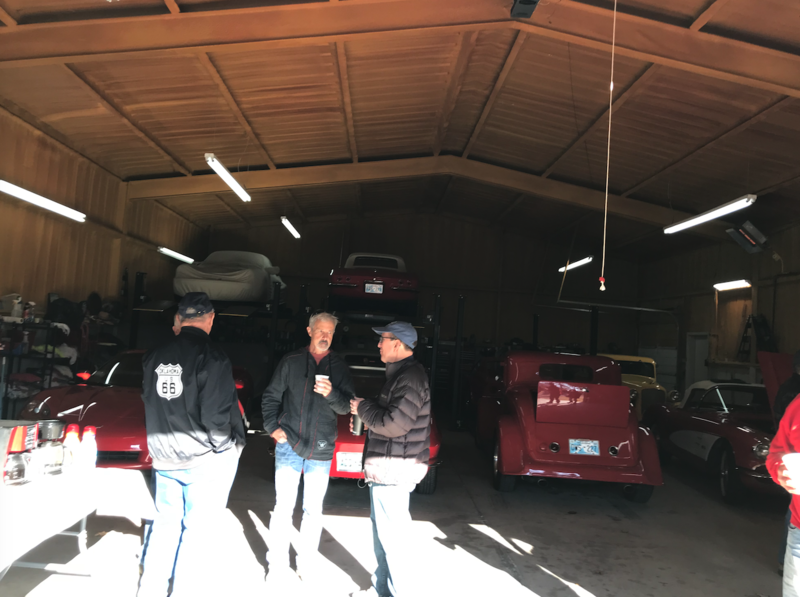 And finally, a little bit of camaraderie, which is EVERY WEEK at coffee call..... the members make this club, the club doesn't make the members. Above, Alex appears to have a headache from the strength of RUDY'S coffee this morning....when brother was that stout joe! In club news, we continue to distribute no cost, our little cRc logo insurance i.d. card protectors - free to a good car. The concept is that you place your required docs in the bright red folder and can easily find them among the old ketchup packets, salt and pepper packs, old car repair receipts, obsolete roadmaps and the like. 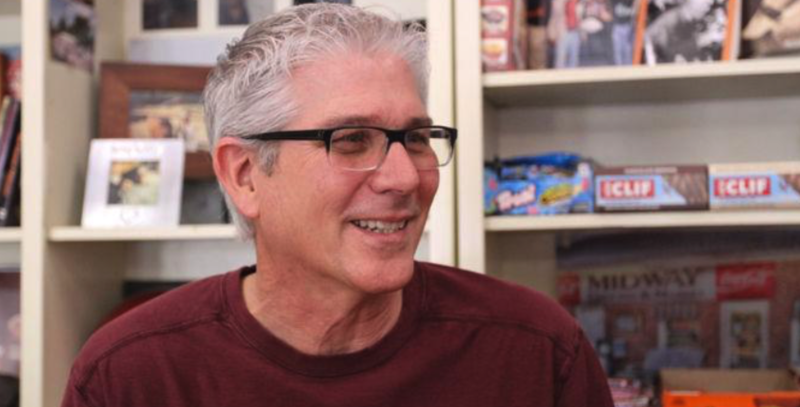 See Dave Saunders at coffee call for yours. 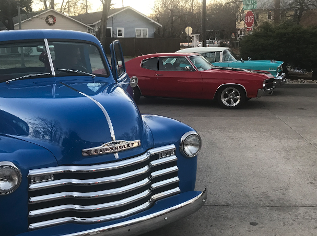 In yet other club news, tonight is the Norman Mardi Gras parade and Charlie is going to take the King and Queen in his '55 Chevy convertible, and Terry is going to drive in his Chevy pickup, and Van is going to drive his Corvette. The parade kicks off at 7 PM downtown and makes several laps from the train station east on main and back around and around. Expect fun. Has anyone contacted Chuck Norris recently? Is he back home and out of rehab? 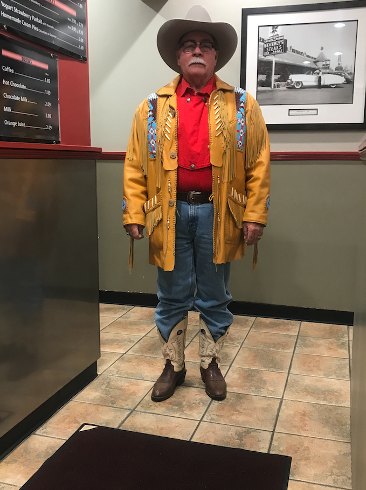 We recently heard the Walt Gage was still going into Ozzie's Diner every day or so, but rather than dining there he was getting takeout. Also the question was asked this morning about Tim Scott? We have not scene Tim since the Veteran's Day Parade. 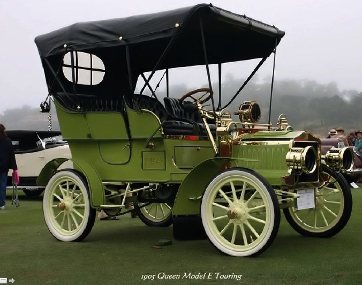 2-27-19 a great pictorial of amazing old cars from the turn of the century. 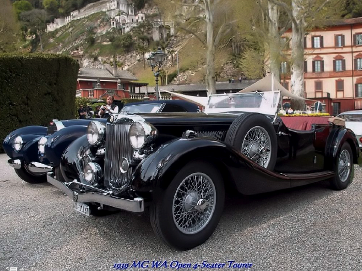 I think these cars are either at the Pebble Beach show or in the Mulhouse museum in France.... at any rate I would say that our club has several examples of this type rare vintage car. 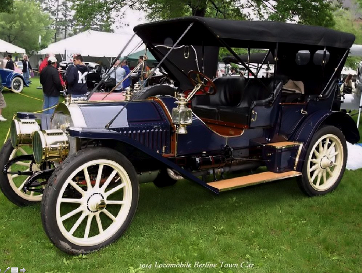 ....We are pleased to have a 1914 Cadillac which is worthy of Pebble Beach and if memory serves me correct - has favorably competed there.. see our club photos below.... every bit as beautiful as the ones to the right. 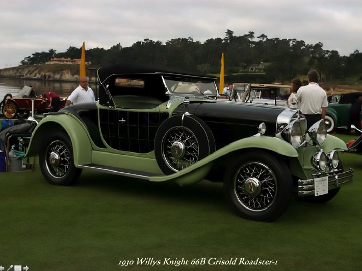 Bill's classic Riley.....a very rare car, for Oklahoma and the midwest if not the entire United States. 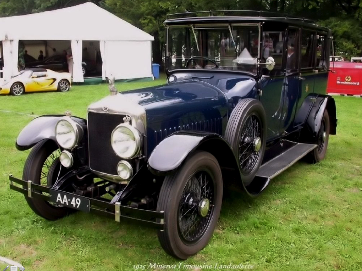 Certainly you can argue for years the merits of one car vs another, but I think we do pretty well as a local car club to have a very good group of really great cars. 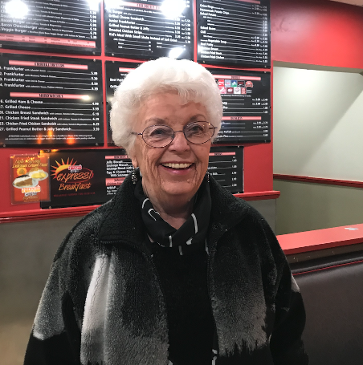 Recently, Marilyn received an email from the "CANADIAN RIVER CRUISERS" informing her of an invoice, just click on the convenient link provided. Since the club doesn't have an email account with the words "CANADIAN RIVER CRUISERS" in the email address, she asked me about it. YEP, IT IS SPAM. It is important to note that our website is open to anyone searching the internet, and there are a number of folks who have the need to send out trash. Should you receive any email from the club using our crccarclub@aol account, it will never ask you to click on anything, or to reveal anything. It might be an update to something important the club is doing, or reporting on the passing of a member - but never anything different than that. I know that email addresses get compromised a lot. I can tell when I actually send something out to our 300+ email address list, about 20 of them come back as "no such account".....just be mindful of this, OK? Coffee grounds......Saturday, February 16, dead of winter, 21 degrees. 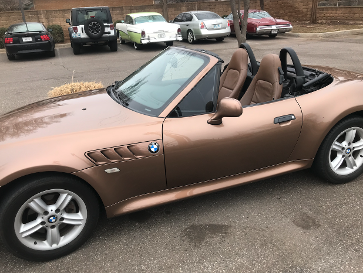 We award the wool long johns award this week to Carol and Jim hoffman who drove Carol's BMW - top down to Johnnie's Broiler. 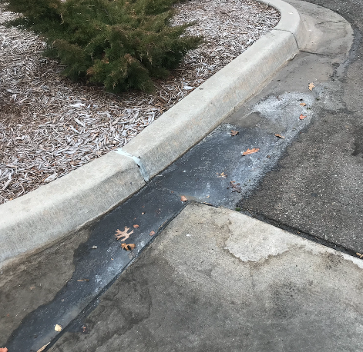 Note the frozen ice in the parking lot gutter. We began sign up for our Spring cRuise to Wichita Falls on Saturday April 20th. 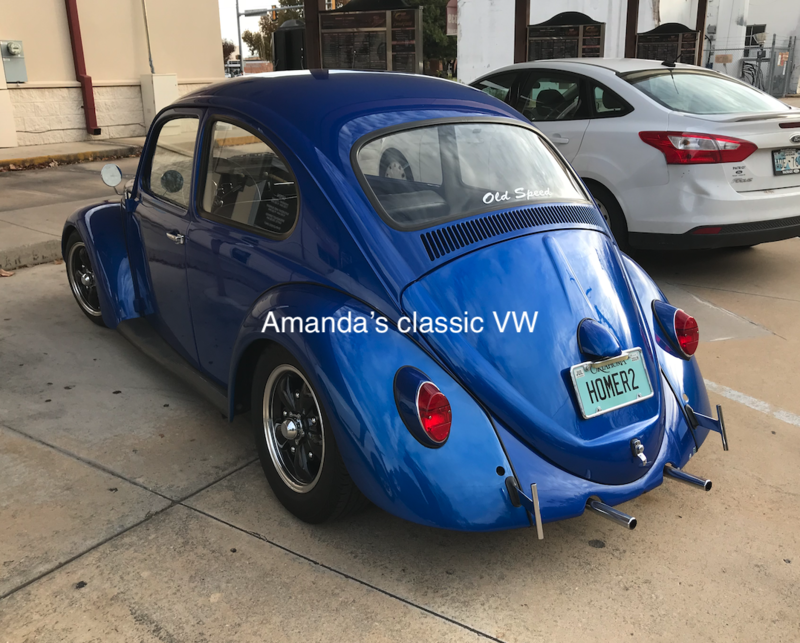 The final format is still being perfected but we will leave from coffee call at Whataburger, follow surface roads to LAWTON, stop for lunch and a rest break there and continue on to Wichita Falls where we will tour 'HAROLD'S CAR SHOP" and then go by the "LONE STAR MUSCLE CARS" car lot, returning home following that. Rumor has it that some of our potato, potato, potato gang will be riding their motorcycles on the cRuise. FUN FOR ALL. we have about 15 people, 11 cars signed up so far. Ronnie Milsap leads us through this 1950's, sometimes shameful, sometimes memorable look-back in time. how many of the items can you remember? Mr. Potato Head? Chutes and Ladders? The various juke boxes shown? And then this shot of the rather cold attendance. Yes it was cold. Better luck in March when we begin holding our Saturday coffee call out in the Crest parking lot. We will plan to have our blue top canopies up and you bring your lawn chair. Coffee and donuts will be available for purchase. Drive something fun. If you have been to the tag agency recently, they may have told you that beginning this year, in addition to your expiration sticker on you tag and your insurance card, you must also have in your glove box the official paper receipt they give you at the tag agency. They give you several documents - best just to fold the whole shebang up and put it in your glove box until we know exactly what is required. you can put it in there with all of the other EXPIRED insurance cards and tag receipts and 10 year old McDonald's salt and peppers and leaking Ketchup packs and roadmaps of New Jersey and Wisconsin. We have not seen exactly what is required - one of those documents that they give you back with your tag sticker. 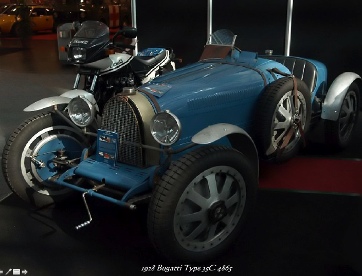 Posted February 4, 2019 - news of interest for club members. First a big thank you to Terry and Becky O'Dea for representing the club at the Annual Norman Regional Foundation gala. This dinner is held every year at the Postal Center Marriott and is a big deal. 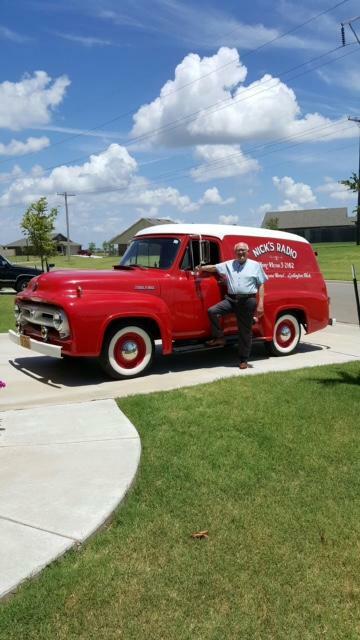 Folks love to have their photo taken in front of the car - in this case, the O'Dea's classic 1955 Chevy "Old Yell'r". This year the theme was "A NIGHT IN OLD HAVANA" and their classic Chevy fit in perfectly, well, it is much nicer than most of the classics in Havana. Terry also fit in with his big Pancho Villa moustache. This is a great example of just how many ways members of our club give back to our community. OK, WHAT IS THIS? WHAT IS GOING ON? Well at least Charlie's car is in Scott's excellent hands. And then our weekly photos from coffee call. Whataburger struggled this weekend to keep us in coffee, running out a number of times. As nice as their parking lot is for coffee call, I will visit with their manager about this. Harlan, Wayne, and Jim have a discussion about the lack of coffee! We had not seen PANELMAN in a while and so Jon and Lani spent some time catching up. June made it back for a visit from Colorado. Good to see you June! It was good to catch up with Duane who drove up from Purcell for coffee. Roy said "Winter? What winter!" and rode his Royal Enfield to coffee. 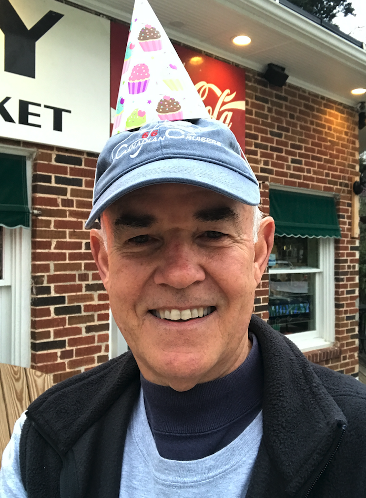 January 29th - We posted our first interview of 2019 with cRc member Dan Rohring on the "MEET YOUR MEMBERS" page. Click below to navigate there. cold was the word today, as our morning temp was about 26. 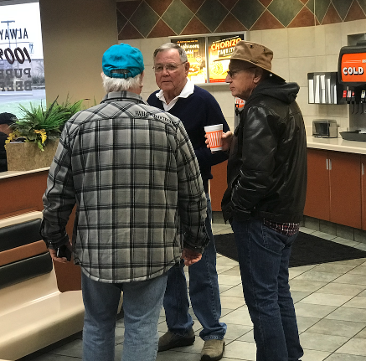 It was "REUNION" day and we got to visit with a few club members who have not been at coffee call in the recent past. 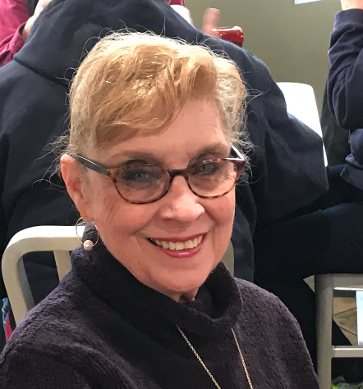 We were well attended today with both cars and club members:We got a health report that Mary Jane McCain has moved to a memory care unit. Zack is spending most of his time there. Charlie and his red and white 1955 Chevy convertible. Nice job Charlie!!! And THAT was coffee call for the last weekend in January! Next weekend we will go to WHAT-A-BURGER on Main Street in Norman. 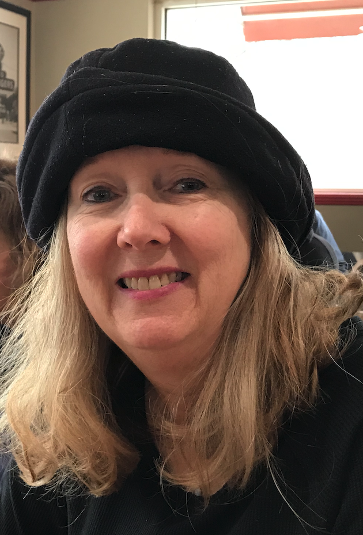 January 25, 2019 TECH CORNER - did you know? The cRc website is "optimized for your cell phone"? The website looks quite different if you look at it on your computer vs your cell phone. On your computer you will see all of the web pages displayed with their names. If you look at our home page using your cell phone, you will see three little lines above the page title......if you click on the trip of lines, all of the website page choices will open for you to select. So if you want to see something beyond the club calendar, click on the three little white parallel bars at the calendar page and see what happens. OK Vinny.......and so it was. Congratulations to June and Vince Letta who recently tied the knot. 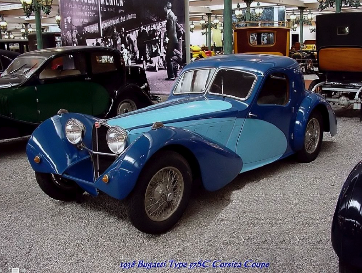 The crc wishes you a happy future and many classic cars. In other club news - this quarter's 50/50 pot was clearly a "TERRY to TERRY" event. Lawrence Terry won the first pot a couple of week's ago, and TERRY O'dea won it on Saturday. There was $180 in the pot and Terry donated the entire pot to Variety Care of Norman. 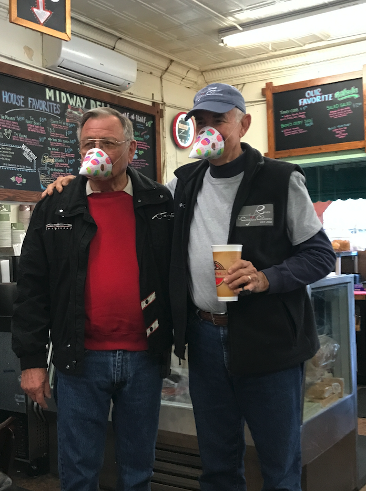 In addition to the club making a donation, MIDWAY DELI donated 20% of their profit from yesterday's sale to the local charity. And finally this bit of news from "DOWN UNDER".....our motorcycle duo of Jon Forman and Philip Scott, who spent the past month touring New Zealand and Australia - have survived the trip and were both at coffee call. 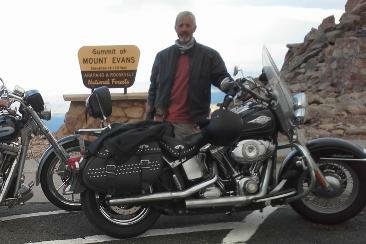 Look for a page to appear on the website soon as Philip wrote a trip blog for us to enjoy. 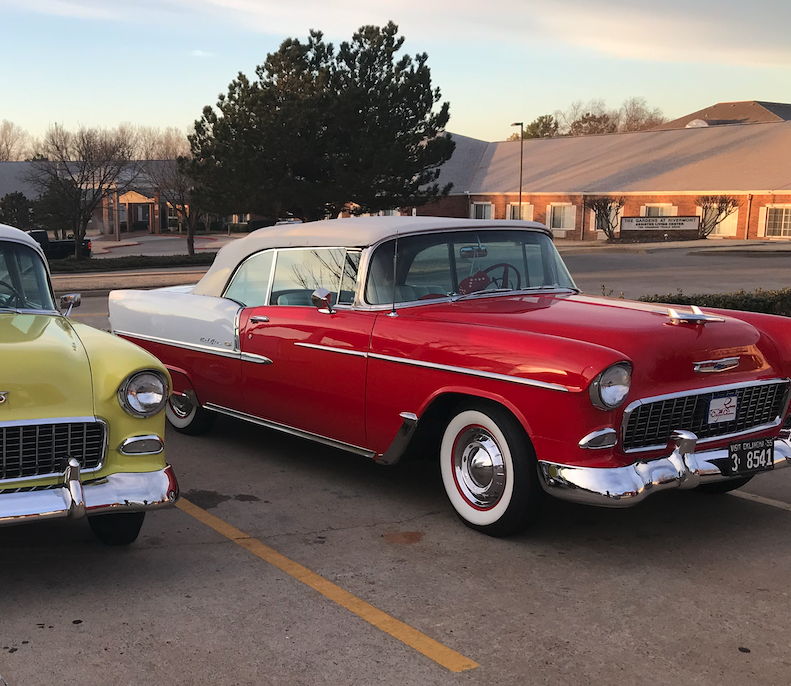 Congratulations to Terry and Becky O'Dea who have been invited to display their 1955 Chevy (Old Yell'r) at the Norman Regional Hospital 2019 Gala to be held in February at the Marriott Postal Center hotel. Now what we have here........is a photo of where we are headed on our spring cRuise on April 20th to Wichita Falls....more information to follow. Yes, of course there will be food involved.....we will announce exactly where at a later date. 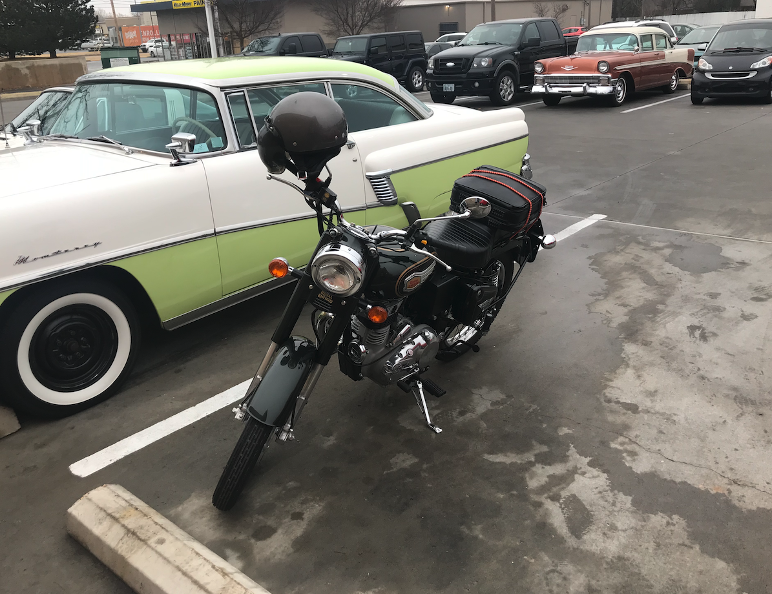 Quiet and cold week - we had a decent turnout at J-Pat's- Boomarang Diner on Saturday. 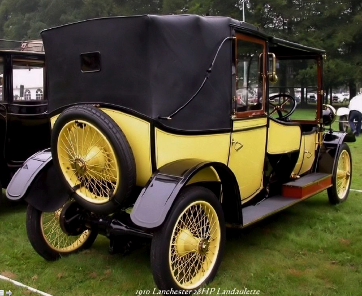 Lawrence Terry was the only member driving a classic car. The rest of us made the decision to keep them in the barn. It was cold and rainy. 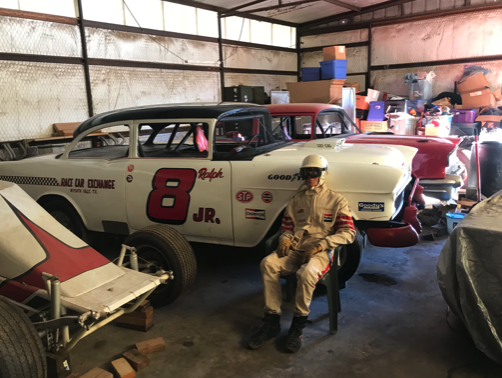 Young Zack has another barn find that has been purchased and relocated from Wichita Falls, Texas to Norman. Let's see how long this little Ford pickup lasts. Maybe it will make it to one of the coffee calls but we are not sure. A tip of the hood to Zack for his ability to sniff out fun things which are locked away. The Spring cRuise is taking shape. 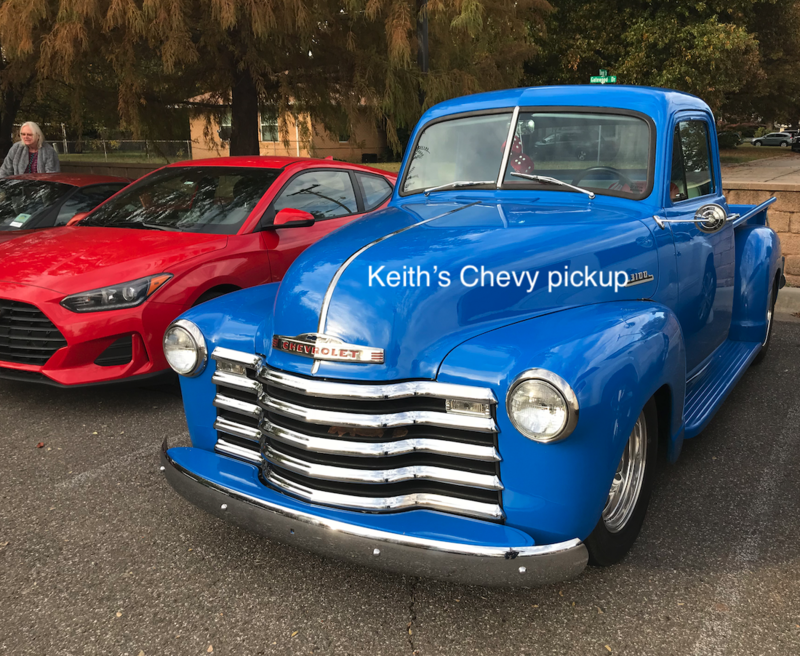 Carol is working on a cruise to the spot where Zack purchased this truck, in Wichita Falls, to tour his collection of race cars and aircraft. 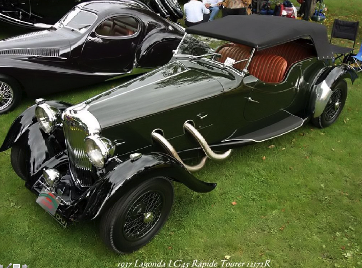 This would be a trip down the I-44 toll-road, and at freeway speeds - so not for every single cRc classic. 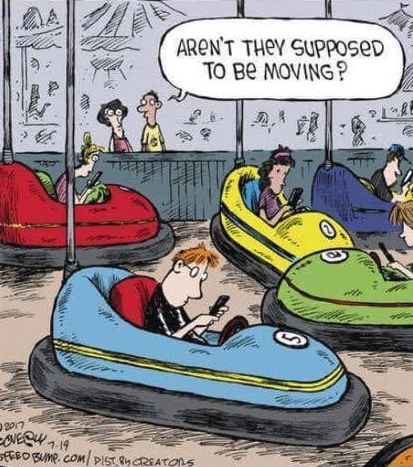 Modern cars would be encouraged on this cRuise. More information as we get closer to the date. As always, there would be a fun lunch stop included. 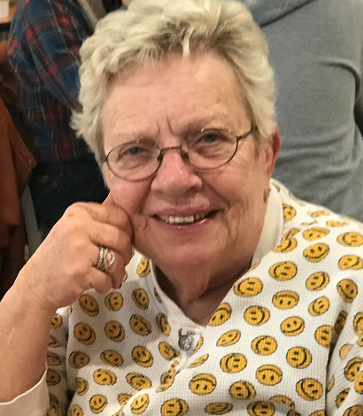 HEALTH UPDATE: Mary Henry - following a planned surgery about a week ago, Billy reports Mary is doing just fine. This is good news. 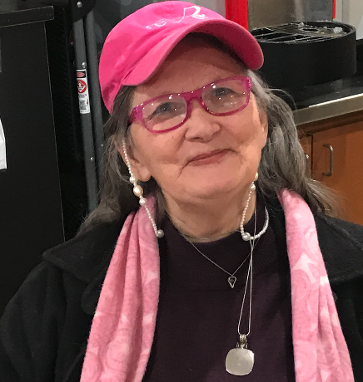 We wish you a speedy recovery Mary!!! 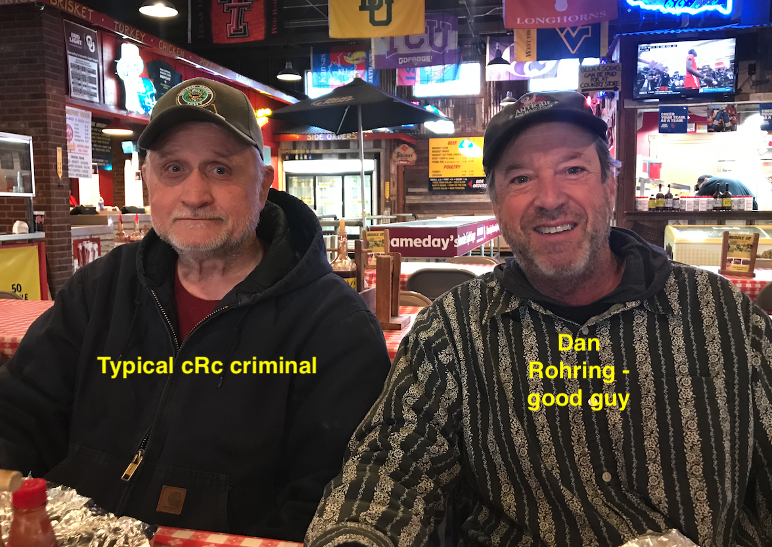 Posted, January 9th, 2019 little did you know dear members, that there is a sub-culture of cRc members that have been caught on youtube. They are informally called the "cRc ICE ROAD TRUCKERS"......you need to see this to fully appreciate our "sedate oldies music" at the car shows. It is quite toned down from what it could be! 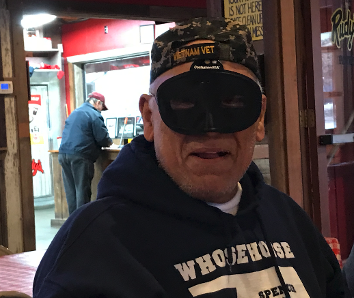 To see the video and learn more about the secret lives of several of our truckers, errr members....click the link below. You know you want to click it, so go ahead! 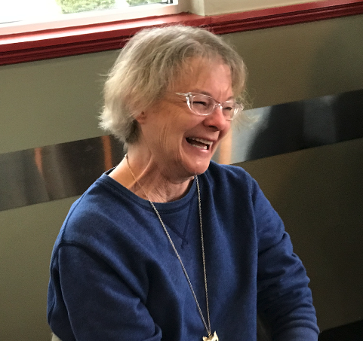 With apologies in advance to Ruth Waldron............and so it was that in front of the entire club, Ray whips out his 1992 model Motorola "flip-phone" and garnered immediate stares from everyone in Johnnie's Broiler. And these photos depict the "rest of the story!" Ray is a litle defensive about his phone, but obviously proud of it. And thus it ended......each of us has the things in life we are proud of....for Floyd - it is his cheap pen collection, and for Ray - it is his steam powered cell phone. As for the rest of us.....we are not about to tell. and Terry is "CLUB PROUD"! To their hard work in getting all this ready for BOTH the May Rose Rock AND the July cRc big show in Norman. 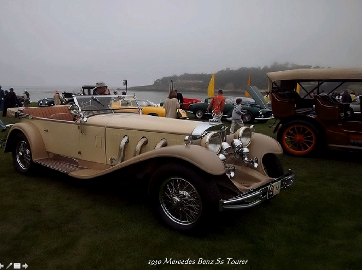 It is posted both on the club calendar page AND on the car show webpage. 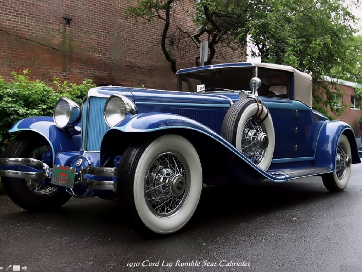 Get your cars polished up and running cause in 2019 we are going to have some fun! We will accept nothing but fun (NBF) in 2019. 50/50 pot at coffee call at JOHNNIE'S BROILER. Tickets will be cheap! And the usual folks did turnout......And nobody did a burnout! We supported a number of restaurants in the community with our Saturday morning breakfast series. Midway, Boomerang, Johnnies Broiler, Carol's Kitchen, Whataburger, Rudy's to name a few. Car shows? 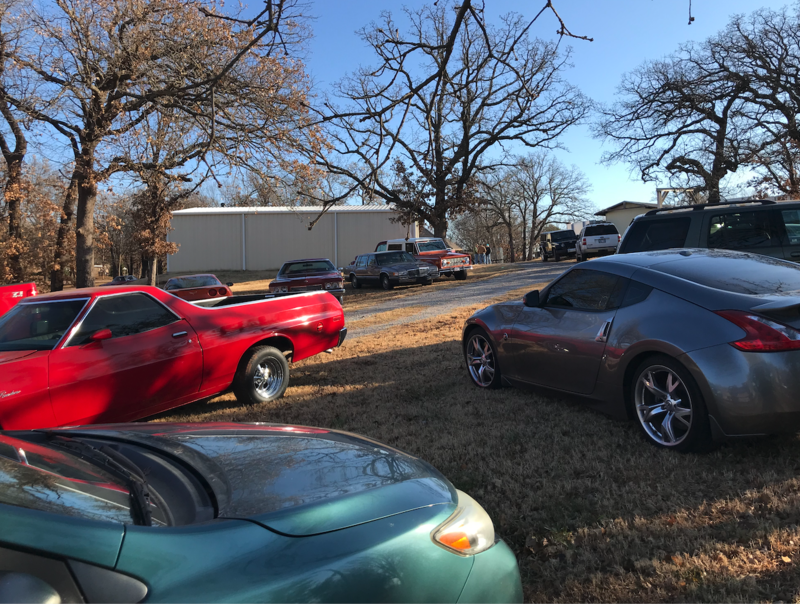 We held them for the Rose Rock Festival in Noble, 2 for Thunderbird Casino, and our own car show in Norman which had about 150 participants and donated $4,000 to Food and Shelter. Midway Bob and family stepped up and donated 100% of their food sales to the shelter. 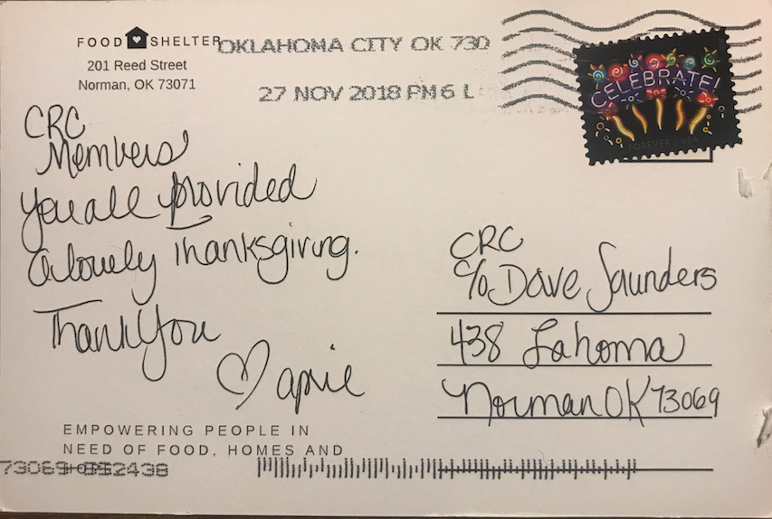 We also made generous donations of our personal money to help Food and Shelter with their "Thanksgiving Dinner for Norman" event. We supported the Noble Firefighters Annual Pancake Breakfast which raises money for the first responders in Noble. 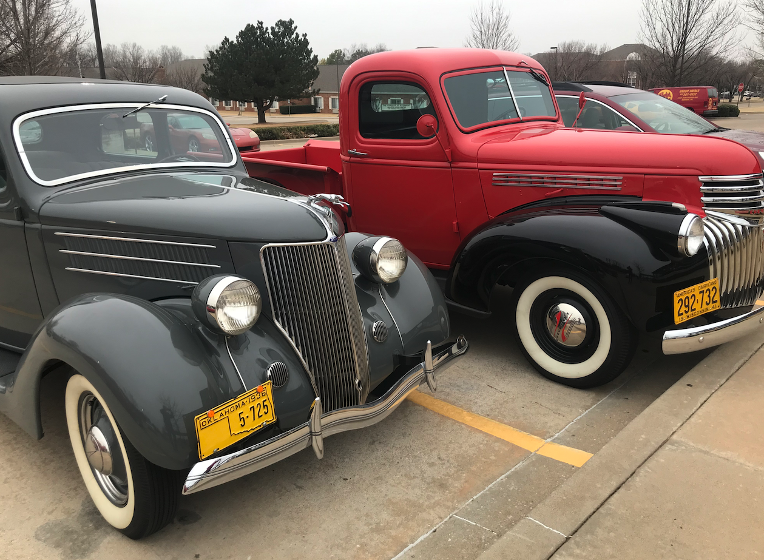 We put a couple of classic cars downtown for the Norman Senior Citizens Group event, and we had cars on display during the Norman Mardi Gras parade. 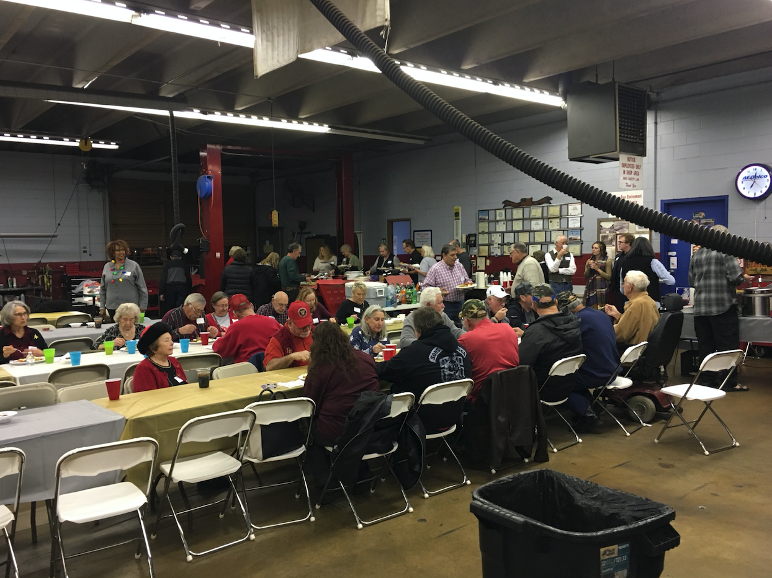 We celebrated cRc charter member Eddie Paulus' 90 birthday at Mastertech and everyone had fun. Ed is one of our two remaining World War II Veterans, Ruckus Bob being the other. 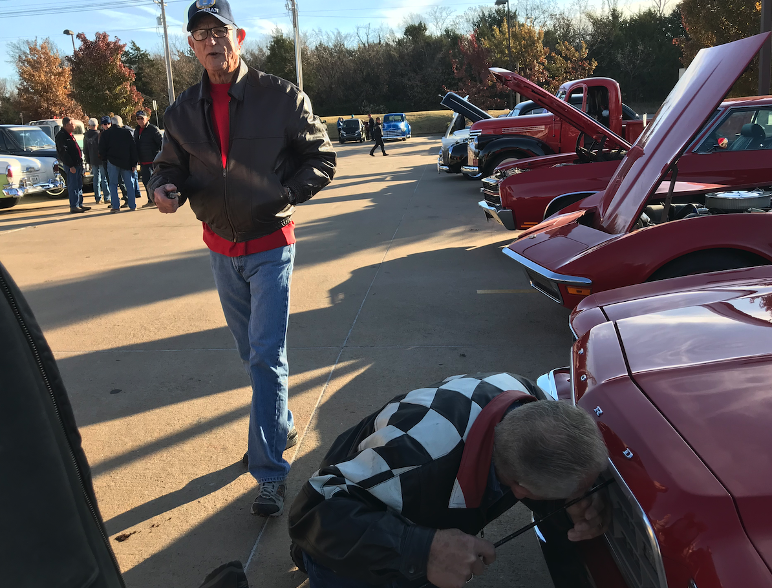 Terry O'Dea worked as our liason with the city of Norman to make their Veteran's day parade a special event with our cars. 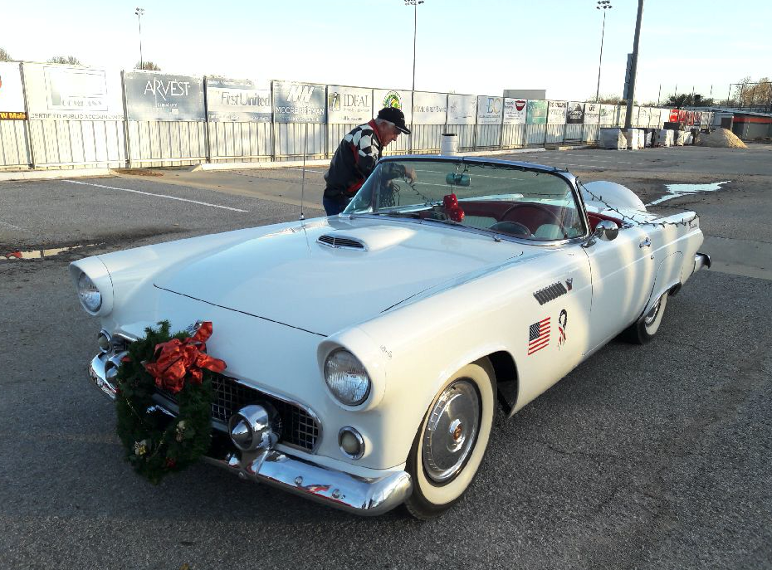 He also assembled a dozen classics on almost no notice to greatly enhance the City of Nobel's Christmas parade, as well as earning the cRc winning an award this year in the Norman Holiday Parade. We even did a small parade for the University of Oklahoma. 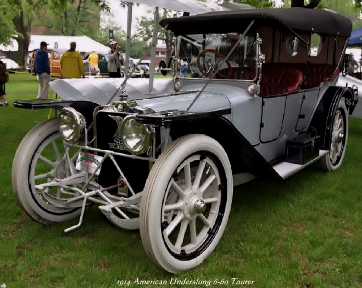 Our car show team went far and wide, displaying their cars every Saturday in season, winning trophies and club particiation awards, and more importantly, supporting the good causes around the state that these shows support. Along the way we managed to support STASH and their community efforts, the City of norman with their movie in the park series, and Rivermont and Arbor House retirement homes for their events. 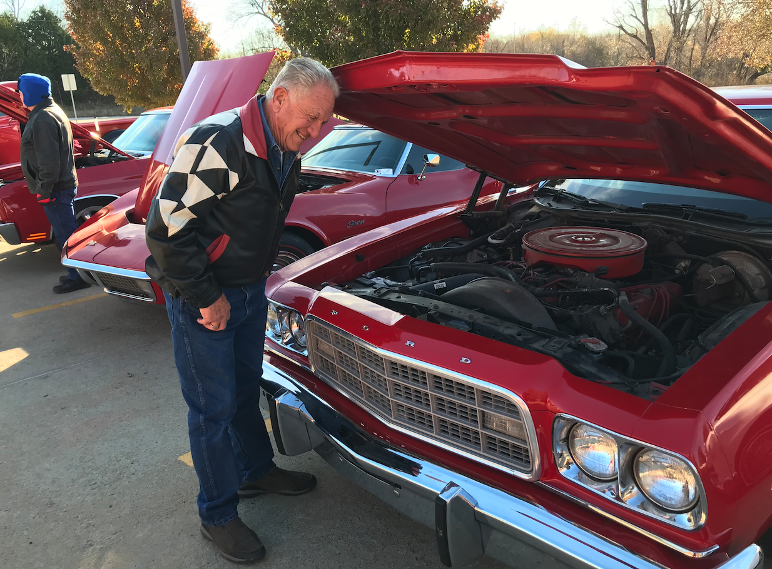 We turned out a number of classic cars for Norman's annual CROP WALK, benefiting the hungry in Cleveland county and sponsored by our club charity, Food and Shelter. That day the club had to "divide and conquer" and we also supported the revived First Baptist Church show. 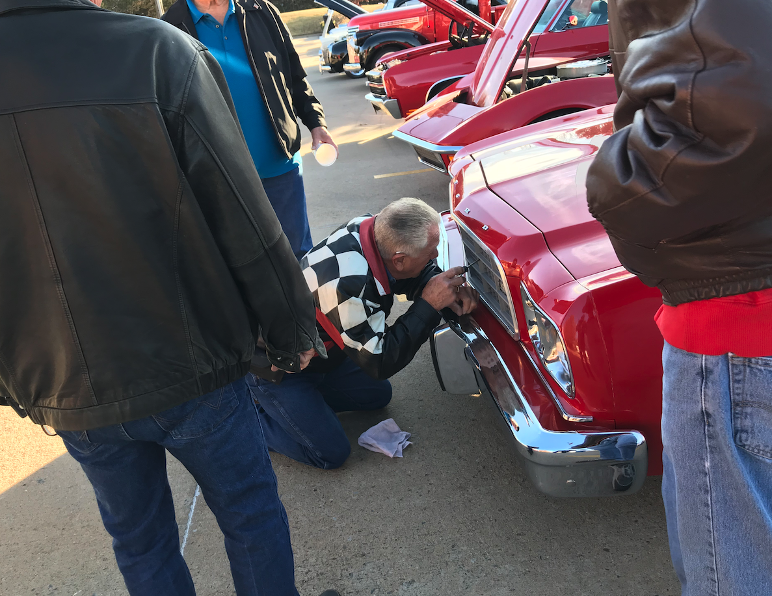 We did our first ever support of "Classic cars on campus corner", near the University of Oklahoma. 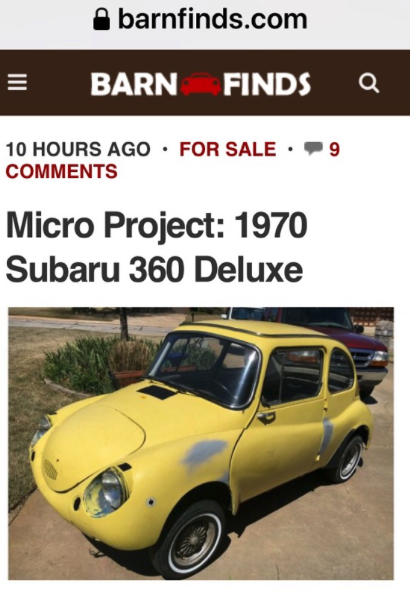 We were amazed week after week as 'young' Zack brought in barn find after bard find to coffee call. Some he kept and some he sold immediately. That little green Olds is really a sweet ride. Harlan and Kelley held a Car-Be-Que and pot luck out at Hall Park and we all enjoyed the great food. 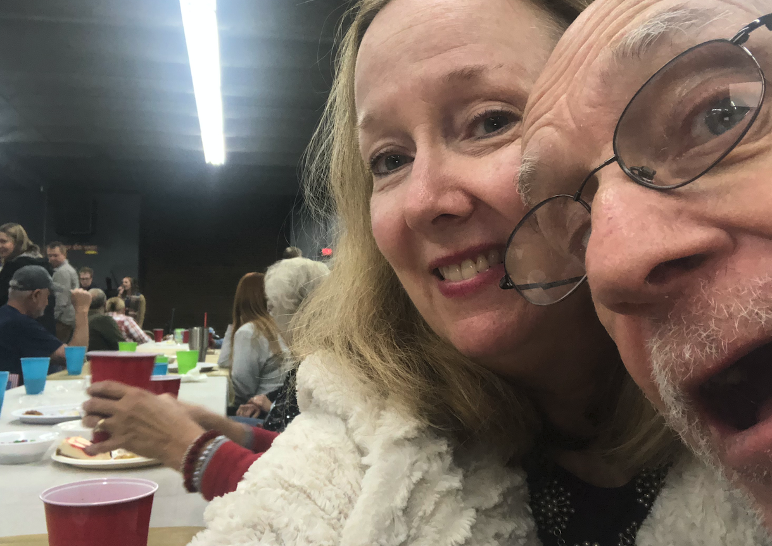 The Christmas party this year was attended by more than 120 members and guests, and we again enjoyed the lovely voice of Rachel Snapp as well as the banjo tunes of cRc member Dan Haggerty and his guest Bob French. 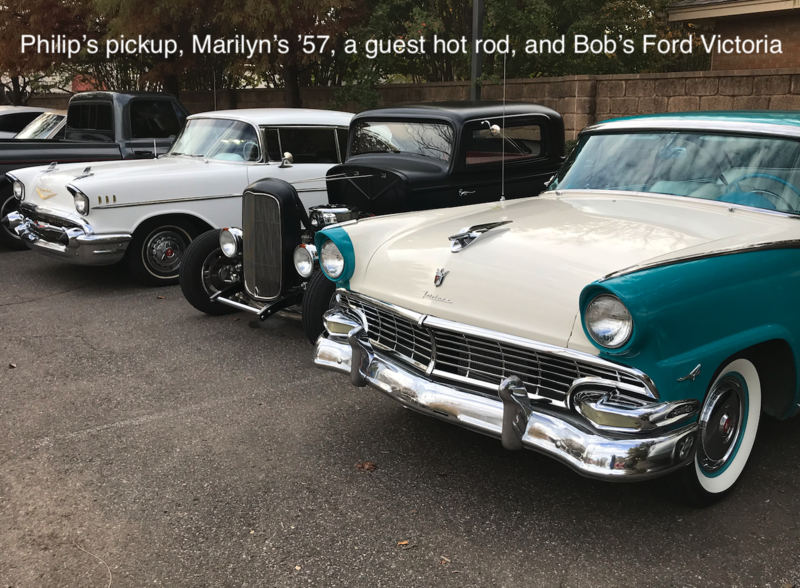 Kay and Dale Cook represented the club at the Norman Regional Foundation annual gala, and we did a small car show for OU Dad's day. We said goodbye to Dave and Marilyn's 1915 Ford Model T tanker, the second oldest vehicle in the club. 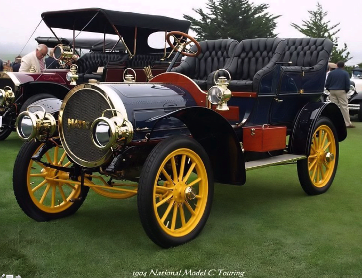 Ron Blisset's 1914 Cadillac is the oldest. 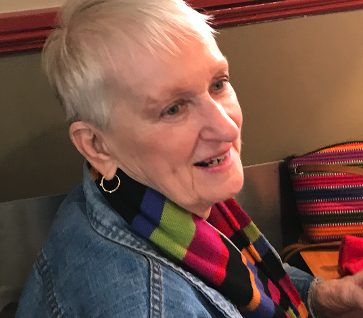 We said farewell to Hermann Wilson, who passed in 2018, and then goodbye to June Wilson who moved to Colorado to be near her children. 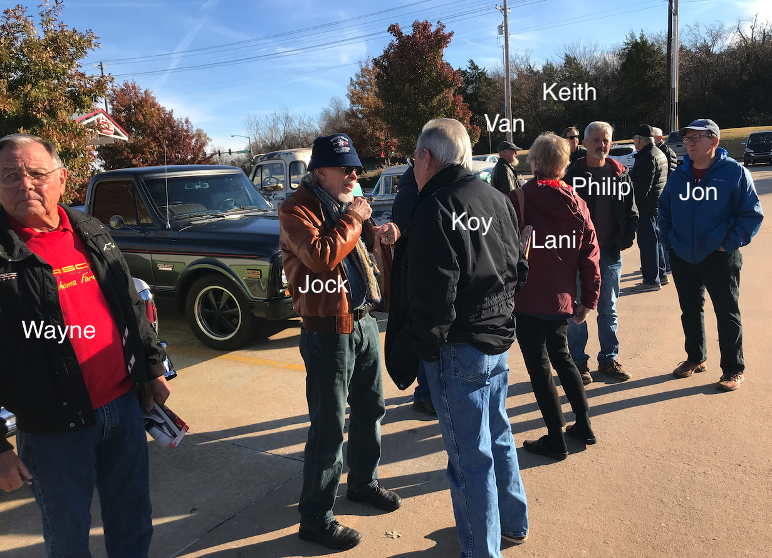 We did both of the Norman Swap meets and drank lots of coffee and told lots of lies. Many of the troops gather every Thursday night at Hollywood corners for their weekly cruise-in. 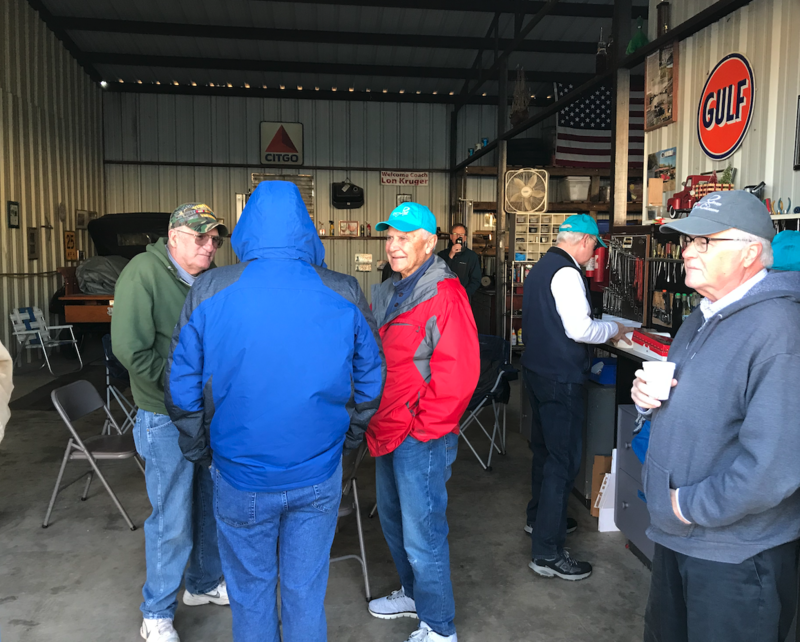 Carol and Jim Hoffman sponsored a fun fall cRuise to Eichen's in Okarche and then we toured the Cavalry post at Fort Reno. We pulled off our fall shop tour and although is was a bit late and a bit cooler than we wanted, it was well attended. 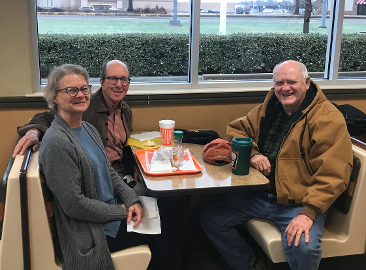 We moved our coffee call in December to Norman High School where we supported the Norman Kiwanis annual pancake breakfast. Their fundraiser has gone on hard times since the parade moved to the evening. It is truly amazing to be a part of a group that steps up quietly and in so many ways. Thank you for being an active member of our club and for all you do for our community. Christmas is just a few days away now. 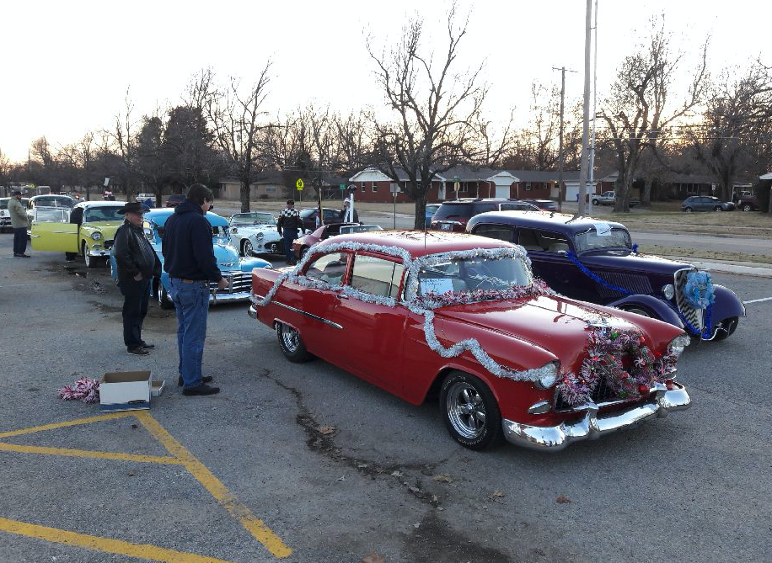 The cRuisers can still put off shopping and find a way to go and drink coffee at Midway, and have a decorated classic car contest and a decorated person contest. 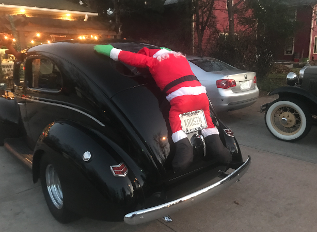 We decided to award a $25 gift certificate to Gary L. for his effort with his Ford truck , and also one to Dan H. for his effort with his black Ford - the one with Santa clinging to the trunk! Gift certificates to Neighborhood Jam (Main and James Garner downtown) and to Ozzie's diner (Norman airport) were awarded. We had a cold but sunny day and by 8:30 people were wandering around outside. 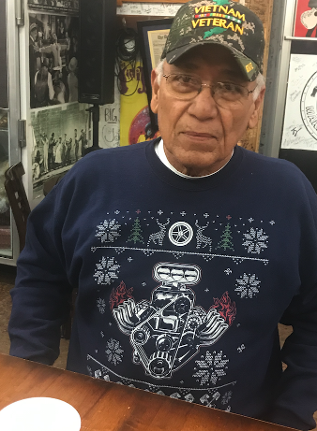 Juan came with a cool sweater, note the timing gears and headers look like a reindeer. Squint a little. 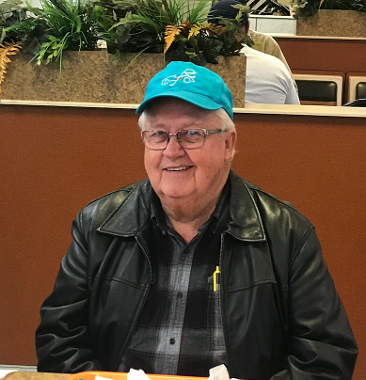 And it was good to see one of our charter members back for coffee - Jim Reinish drove his Ford panel truck "BETSY". In case you forgot what Jim looks like, he is shown below Juan. And my last picture of the day is a trio of Chevrolets....Keith's pickup "BLUE CHIP", and Ray's Chevelle SS, and Lawrence's '57 Bel Air. Three of the finest weekly drivers you will ever see. We will close out the year next Saturday December 29th with coffee at Whataburger on Main Street, as we all await the outcome of our OU Sooners football game against the alabama Crimson Tide. A night game. Go Sooners! I spoke with Chuck Friday afternoon, December 21st and he sounded good, but very tired of being in the hospital. He is currently in the rehab wing and believes he is going home Monday. Like all who are in the hospital, he said "I can't leave soon enough." He is probably correct as he has been in the VA hospital for 24 weeks. He had neuropathy (low blood circulation) in his lower legs and thought he was going to lose a foot to to infection- BUT a doctor saved it. If you want to call him, his cell is 740-7800 and I am sure he would appreciate hearing from you. Now here is an idea that never took off, but there have been many times that we all would have liked to have something like this. A word about the party from Dave. Marilyn and I missed it. The weather postponement was our undoing. We had booked non-changable/non-refundable flights to Atlanta to see my 92 year old uncle and had everything planned out just perfectly - until Mike Morgan stepped up and made dire predictions. The new party date was right in the middle of our carefully planned trip. 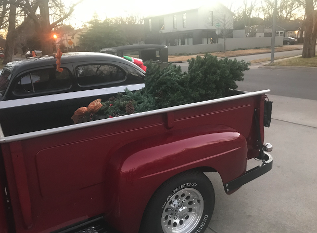 Because I love our Christmas party and never want to miss any homemade dish made by our members, I have planned all our travel in 2019 around the Car-Be-Que, the shop tour, the various special events, Thunderbird show, Rose rock show, and our cRc show......and yes the 2019 Christmas party. We simply WILL not miss two in a row. 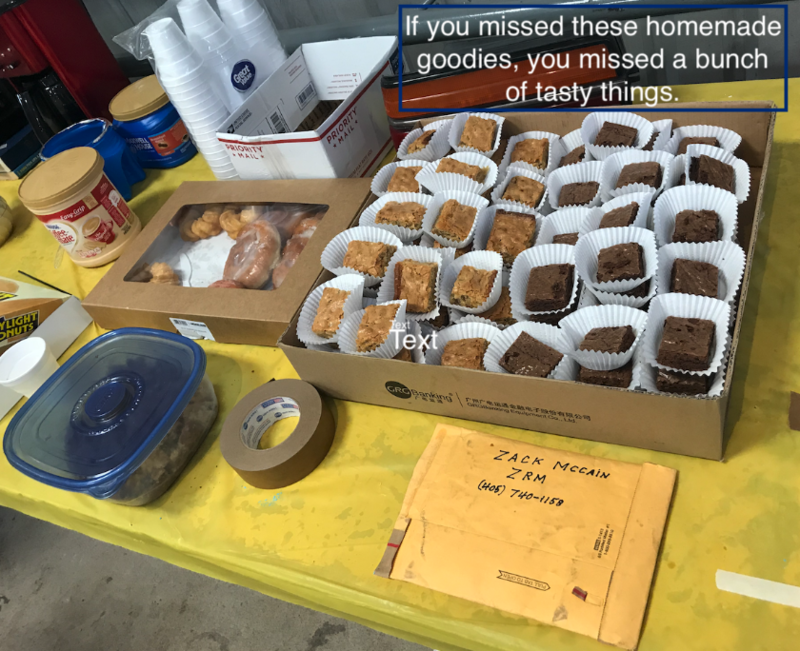 I am glad everyone had a good time, but I am still in withdrawal over some of those outstanding homemade items around the world's cleanest alignment rack. and yes, the DIPSTICKS will be back next year to sing their "greatest hits". The car show team for funding a major part of this year's party. Harlan and Kelley - MC and music. always working behind the scenes so everyone can have a good time. Mastertech family - our wonderful venue, unique in all the and. Bill McBee - for coming out early and doing the setup....where are likely several folks I missed since I was not here. sorry about that. Rachael Snapp - Christmas carols extraordinaire, her second year to wow us with her lovely voice. Midway servers and Bob - main course, always gets us started in style. Everyone in the club - for making this club so very special. 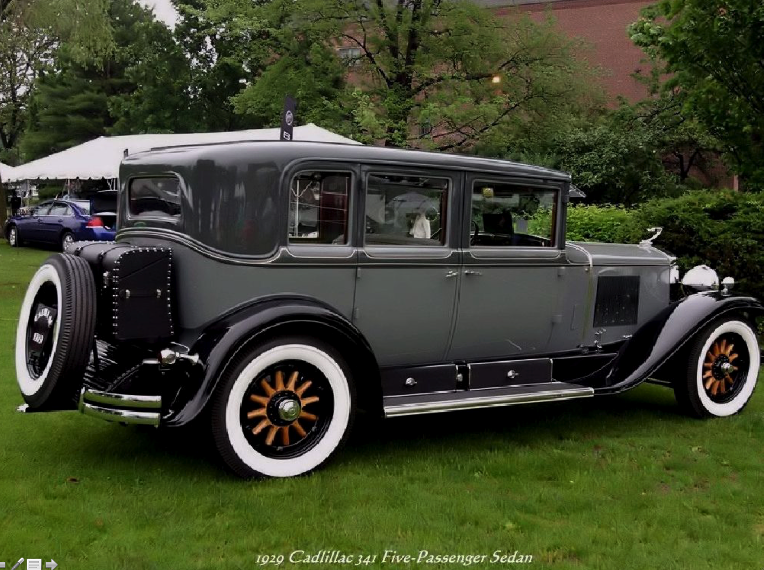 OK, which of our many cRc members will be the first to drive to Saturday car club coffee in the new 2019 Lincoln Continental with suicide doors? 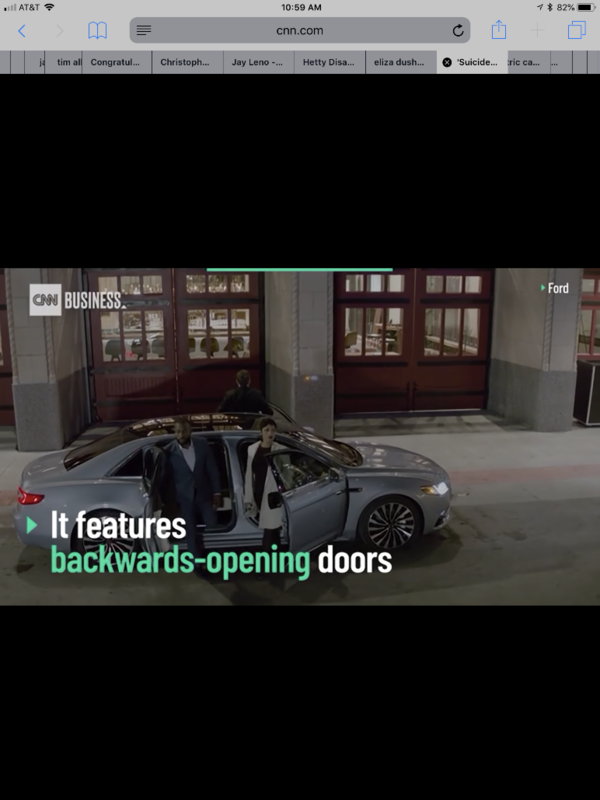 Yes, a special 80th anniversary edition of the Lincoln Continental is being released in 2019 and it has suicide doors. 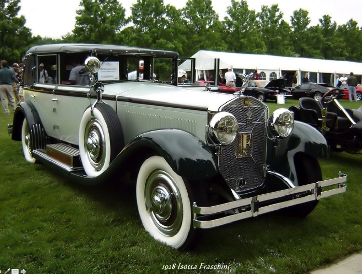 Only 80 of these special anniversary-edition Lincolns are being made and the company will start to take orders soon. 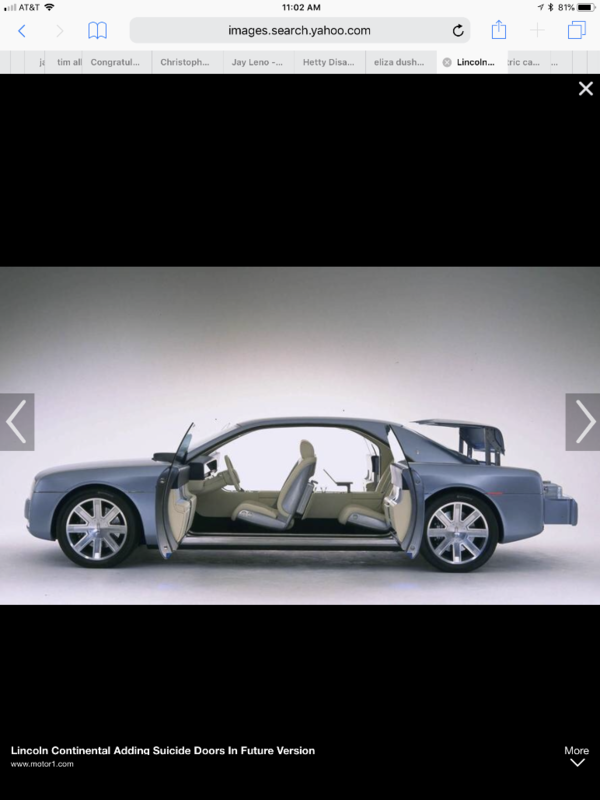 It is anticipated that the car will cost around the $100,000 price point. Let’s get one of these babies in our club! First, congratulations to our cRc paraders who decorated their cars and won the coveted "Most unique entry" award. We are not exactly what that is, but we add this to a lot of other good things and awards the club has won for its community service. Thank you paraders for your hard work in decorating your cars for the citizens of Norman. And so it came to pass that there went out a decree from the party committee that there was to be a grand feast, complete with the banjo and guitar sounds of cRc member Dan Haggerty and noted guitarist Bob French.....and it was done. And another decree proclaimed that a couple of Christmas classics should be sung in grand style and so Rachel Snapp responded and again stunned everyone with her marvelous voice. But the troops might find hunger, and so the decree said, "no hunger tonight" and the cRc responded as it is want to do......with food, mounds of it. Turkey, dressing, gravy, sauce, and enough food to make Golden Corral green with envy. And ours was homemade too! And the decree further stated "let there be tunes for all" and so Harlan and his magical music filled the air. And the same voice proclaimed, "Let there be Hot Wheels for ALL!" .......and so there were.........and everyone came and visited and ate, and listened to the music and took the cars and had a grand time. Thank you cRc for turning out for this annual social. Merry Christmas to all. Car show season for 2018 is a fond memory. So are the cRuises and Crop Walk. These pages have been removed from the menu and will move back to their original spots when things heat up in Spring of 2019....literally, heat up. 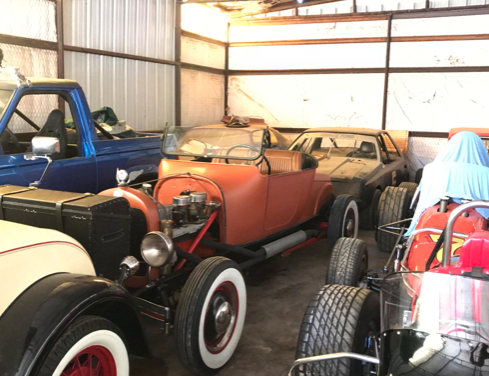 If you need 1/2 a shop at $90 a month, call cRc member Doug Lassiter at 405-802-2747 who will have one side of his available soon. 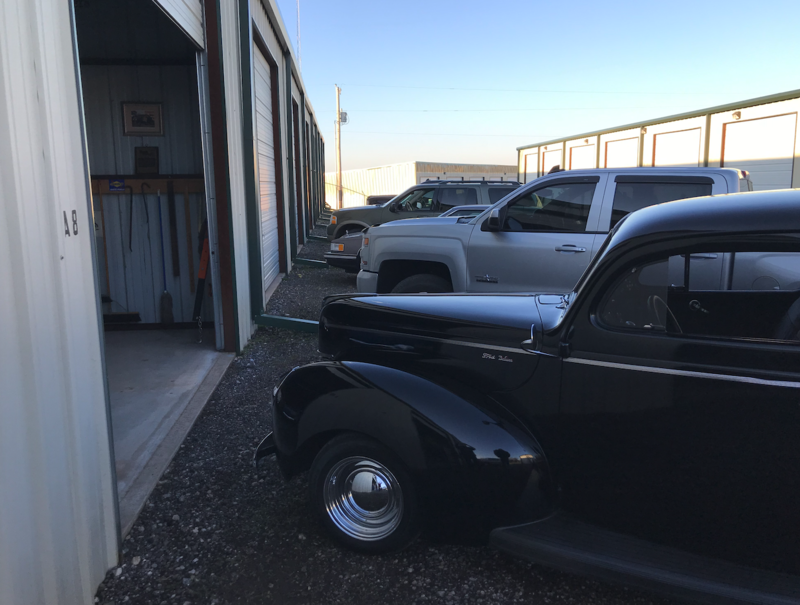 If you need one shop to store a non-running car out of the weather, call Dave Saunders 405-406-3730 and we will find a spot in my shop for $50 a month. 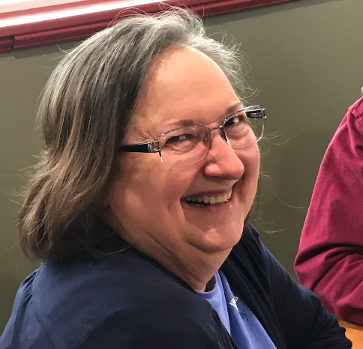 RUMOR HAS IT - that our dear "June" of the Hermann and June team has moved to Colorado to be close to her daughter. We shall miss you June! Before she left, she gifted us with several things to raffle off. Expect to see some fun things in the Spring Swap Meet. FALL SHOP TOUR CAME A BIT LATE! A fun Saturday as we pulled off our 2nd series of shop tours. Our plan is to try to do 2 sets of shop tours a year. The next one will be in spring of 2019. 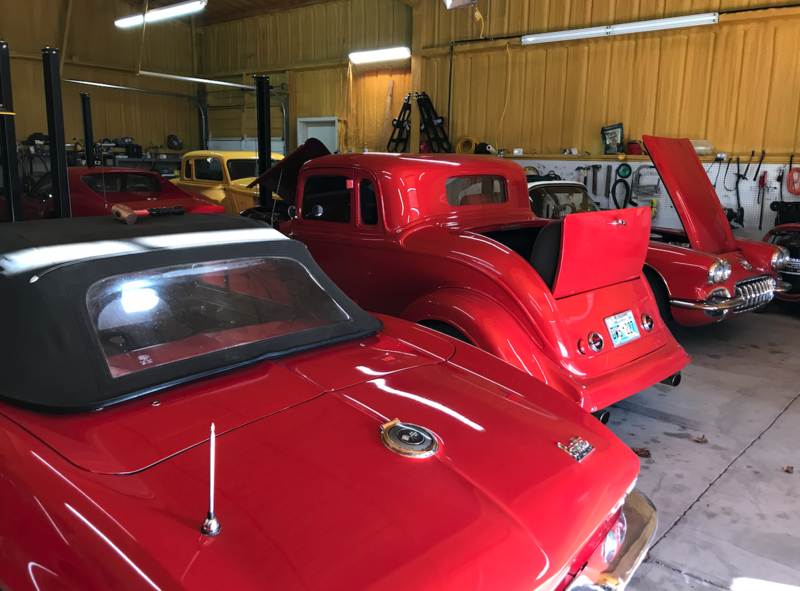 Today we went to Noble and vistited with Dave Saunders, Keith Reames, Terry O'dea and Doug Lassiter who all store cars there. 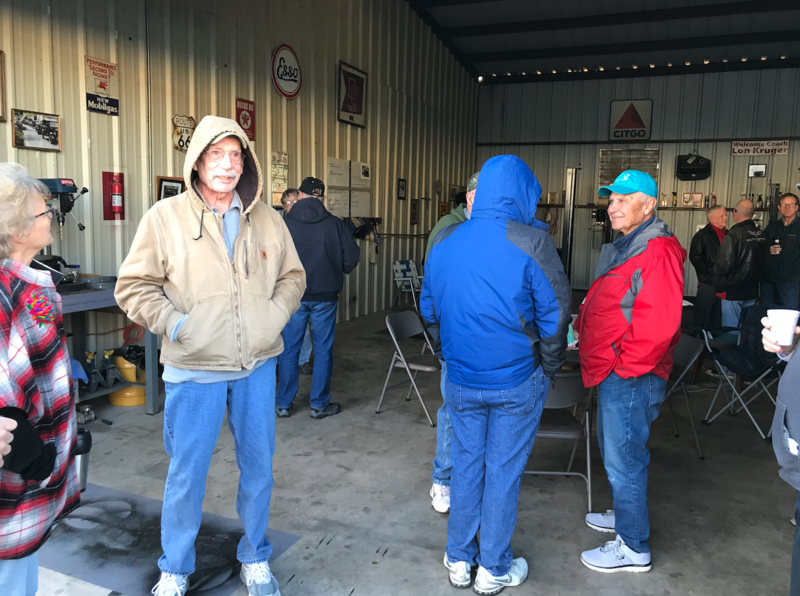 It was cold when the first folks began to arrive, plus Dave's shop has no heat, but we had plenty of coffee and donuts , so all was well. About 9:30, the group headed north to Marshall and Carol's shop (which was nicely heated). 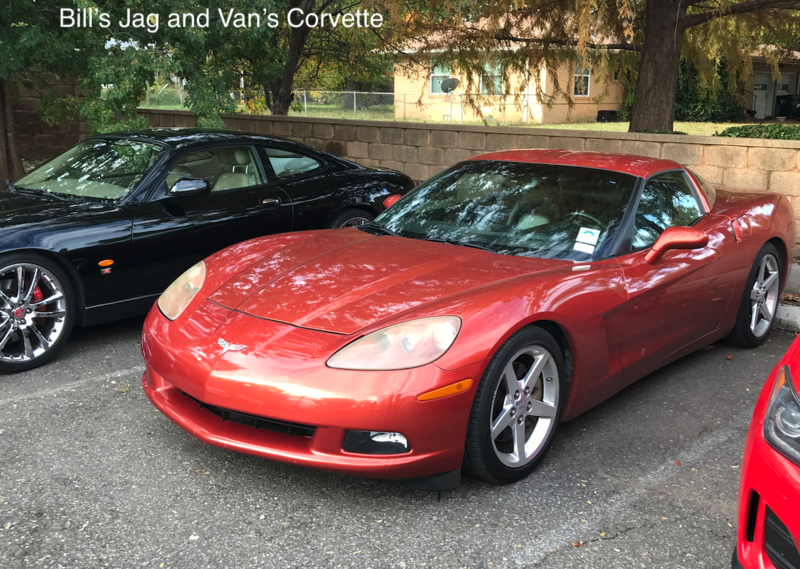 Marshall has a preference for red cars (I believe) and a number of them are shown in these photos below. 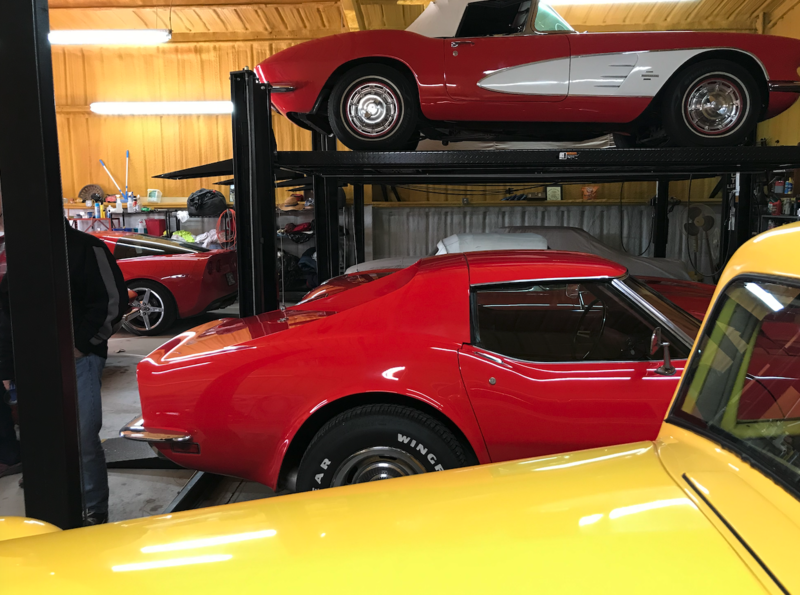 He really has a nice shop, full of red Corvettes and a few other goodies. Everyone enjoyed touring the shops. 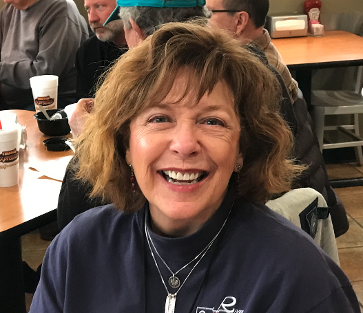 "CRC members...you all provided a lovely thanksgiving." We changed the venue of coffee call on December 8th from Midway to Norman High School to support the Norman Kiwanis Club pancake breakfast. We will try to sit in one area of the cafeteria. And finally, if you have been living under a rock (maybe a Rose rock) and don't know this - the cRc Christmas party will be held beginning at 7PM at MASTERTECH AUTOMOTIVE on Saturday December 8th. Serving line begins about 7:30. This year we will have a variety of musical entertainment for your enjoyment. Sadly the Dipsticks are on a world tour, but they assure me they will be back in Norman in 2019. Norman's Bob French, noted guitarist and cRc member Dan Haggerty,who plays banjo, with present 5 lively songs for our enjoyment. Following that, Rachel Snapp, the young lady who blew our socks off last year with her beautiful opera voice, has agreed to return for an encore. This year, we will offer a vegan selection of foods for those who choose not to partake of the turkey and brisket. If your contribution to dinner is truly vegan, please label it as such and we will place them together in one area. See you there, can't wait! had a "CAR-B-Q". The wind was howling, the temperature on the low 50's (which felt like 35 degrees. We parked all the cars on the windward side of the pavilion to try to block the wind. Not much help. We gave the Veterans free hot dog and they were upset because we didn't deliver them to the building. the food was, as always - wonderful, the camaraderie great. 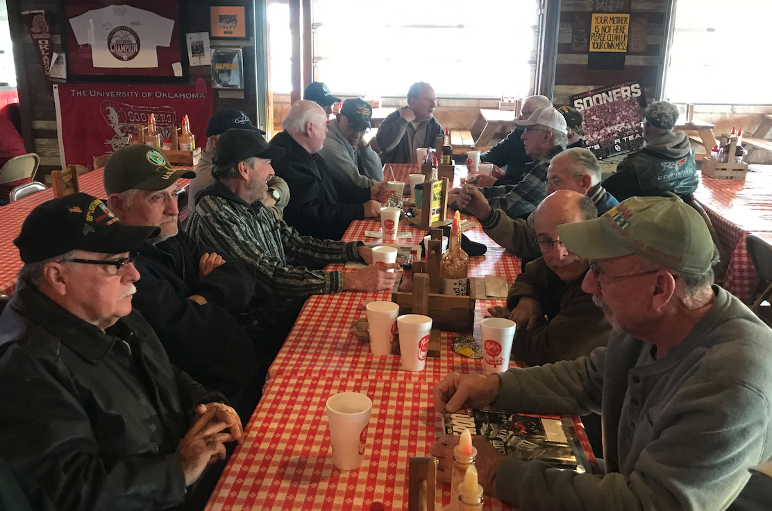 Coffee grounds and brisket - Rudy's, November 17th Thanksgiving is the spirit of giving and today the cRc collected $320 to gift to Food and Shelter to help them with food purchases for the annual Norman Thanksgiving meal. This turkey-and-all-the-trimmings-dinner has been a part of Norman for a long time. All citizens are welcome to enjoy. 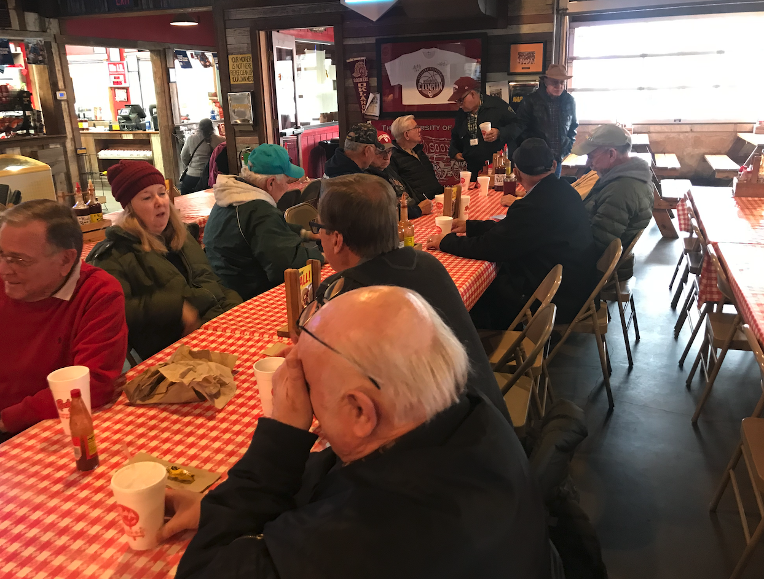 This is a joint event between the Norman board of education, who provides the cafeteria location for the event, and Food and Shelter who provides all the food. Be proud of your club members who stepped up to help provide some of the critically needed funds to complete the meal. Thanks to everyone who tossed something into the paper bag. It has already been delivered to April Heiple. A "shout out" to the 5 cRc members who participated this past Thursday night at the OU "dads" car show......in the dark. I doubt this event will be repeated, but thank you for your help in showing your cars. Gary drove JoNell's 1951 Pontiac Eight sort-of to coffee this morning. 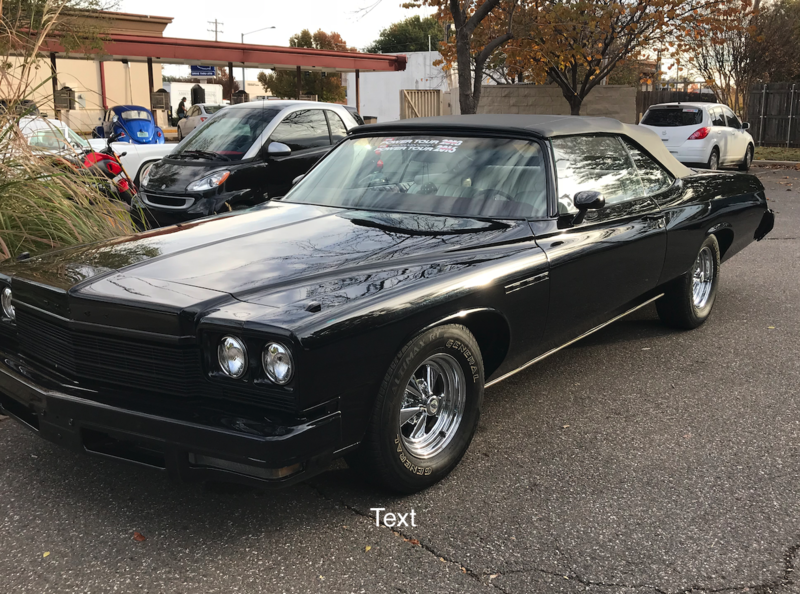 We noticed his headlights went off automatically and so we asked for a car interview - and this is what we learned about the innocent looking little Pontiac Eight. It is not at all what it seems.........not at all. Did I mention "not at all"? And just for fun, we did a second car interview today, this one with Brian Hunter and his metallic blue 1966 Ford Fairlane. And.."PRESTO" they get the hood open! Dan shows his true colors! Sunday evening November 11th - Good job cRuisers. After the machine gun and the helicopters, our cars were the hit of the day. Thanks to all of our Vets who came out for the event. We have several fun photos and several short youtube videos of the afternoon. They are posted on our military service page. Posted 11/6 - the cRc gets the nod from the parade committee to transport the Grand Marshall in the Christmas parade! Terry O'Dea, crc parade commander has selected Charlie's beautiful 1955 Chevy for the task. 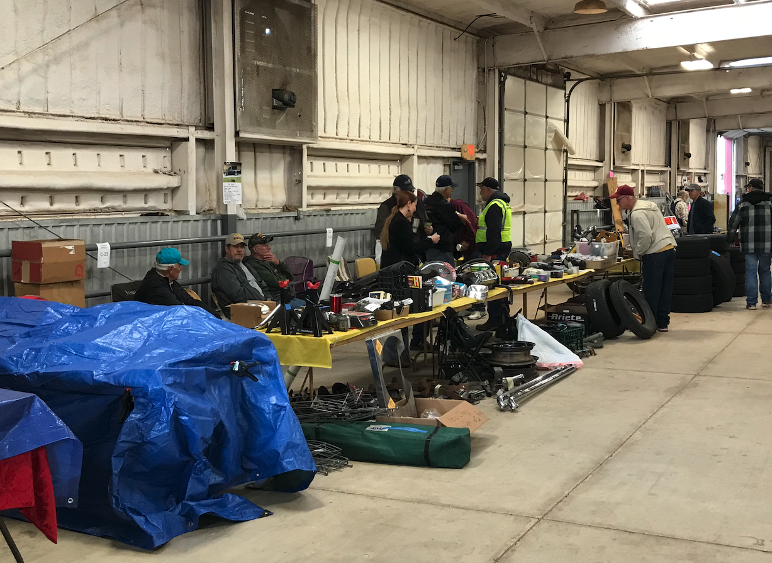 Posted November 1st - The NORMAN SWAP MEET has come and gone until spring, and the club made a few dollars and members of the club made a few dollars. All in all we consumed 9 boxes of donuts, one rum cake (thanks Marilyn), one large container of oatmeal cookies (thanks Lavonda), and about 100 homemade pecan brownies (thanks Harris family).....3 days well spent! 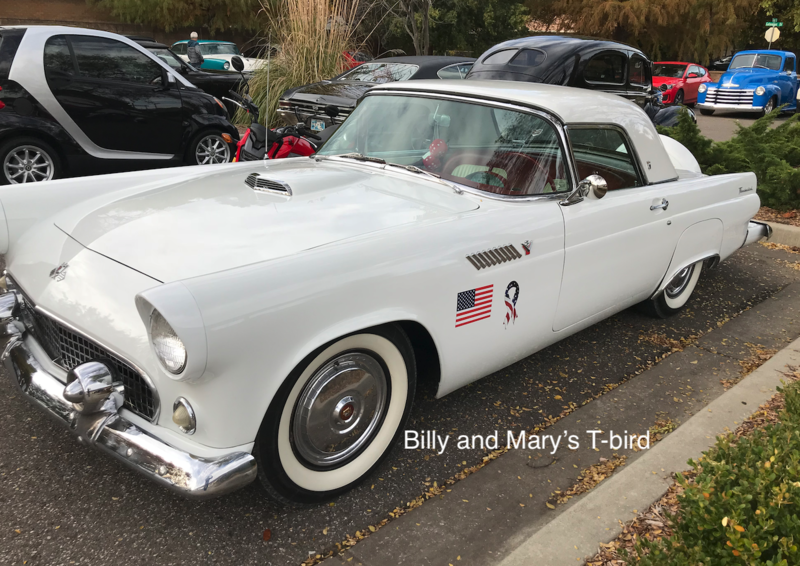 A big thanks to the club members that worked the Thunderbird Car Show. It turned out to be a great show. We made $2400.00 that will go to pay 100% of the costs of our Food and Shelter Car Show in July. 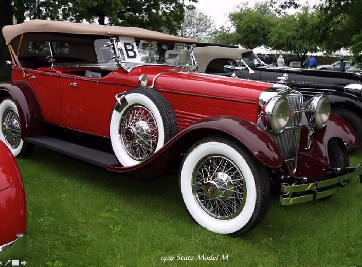 We will be doing an April car show in 2019 at Thunderbird and also the Noble Rose Rock show in May. The Noble show takes in money to pay for the show trophies for the Noble show, with usually some money left over that goes into our car show fund. 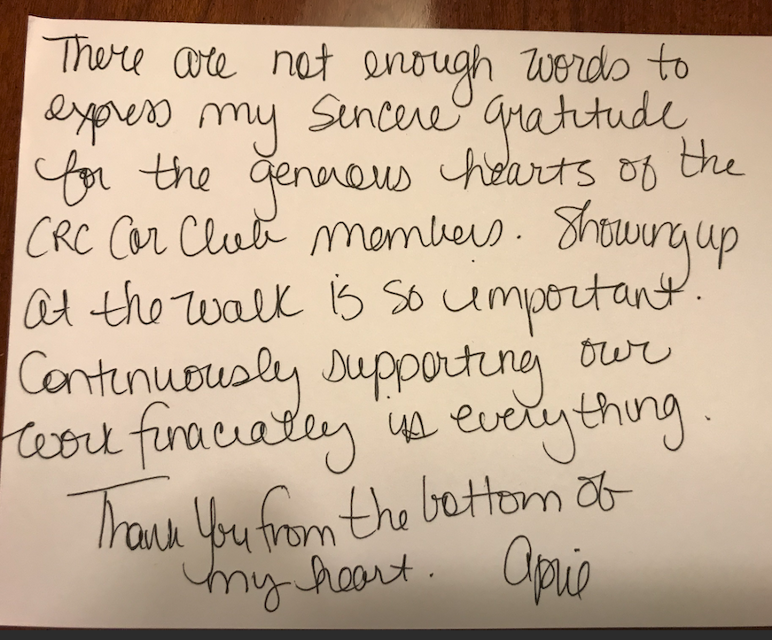 Posted Wednesday, October 24 - we received these kind words on a notecard from April Heiple, Director of food and Shelter. 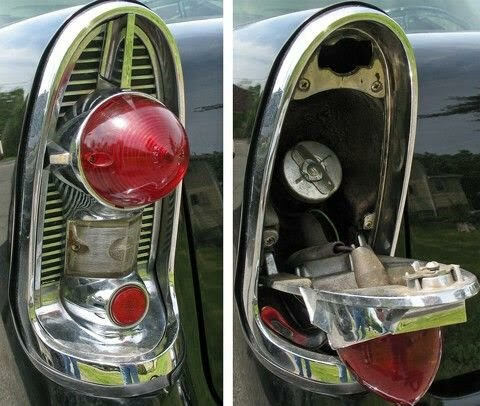 We have posted a non running 1939 5-window ford coupe on the for sale page.......this is a club member's car. Check it out by clicking the link below. Be sure to look at our individual web pages for both Crop Walk (nice article in the Monday Norman Transcript) and the cRc Thunderbird show. The club presents April Heiple, Director of food and Shelter with $392 from the car show. 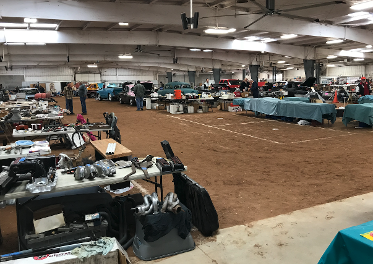 Sunday morning, a brief update: (more to be posted later Sunday) we came, we sowed, we took away piles of winnings and trophies from THUNDERBIRD CAR SHOW! First it was a drawing for $200 every hour, then $200, then $400 and finally $500! We are gifting our share of the 50/50 pot ($392) to Food and Shelter today at their fund raising event. we had 120 cars turn our on this beautiful day. of the past? Seems so.